Cambridge Baby is lovely, they sell wonderful products for babies, children and adults. I always rest reassure that all the products are made with natural fibre which are good for kids skin and good for the environment! .. 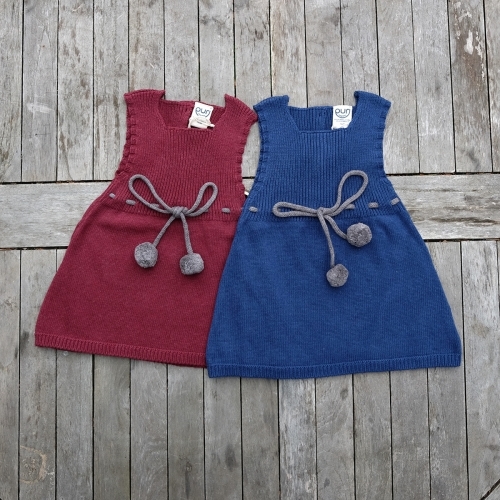 In fine-knit organic Merino wool, these round-necked, short-sleeved vests will keep your child warm whatever they're up to. 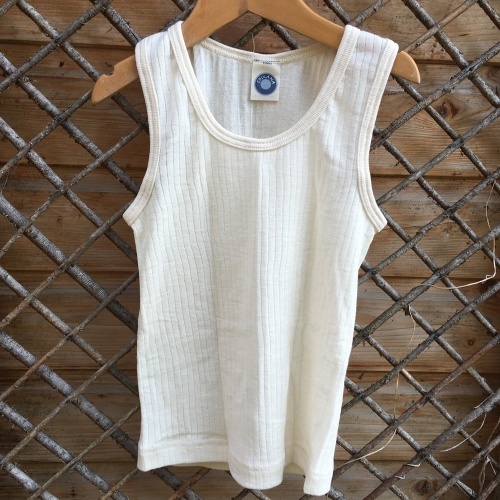 Wonderful value simple organic merino wool vests in a very pure form, but wash carefully. natural with no chemical finishing - 100% skin-friendly. 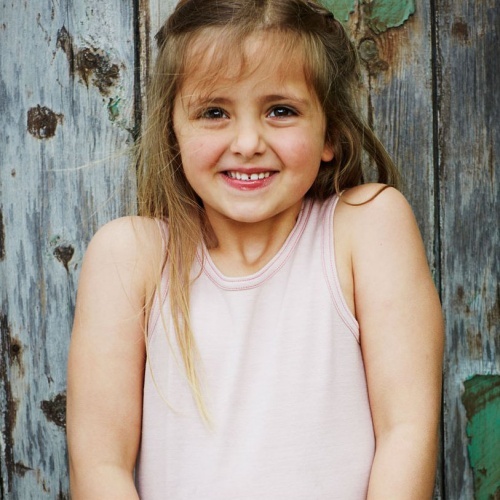 A lovely and comfortable sleeveless vest in soft organic cotton - simple and perfect! This breathable long sleeve undershirt made from soft organic cotton is comfortable to wear. The fine rib material is especially skin-friendly and stable in form. 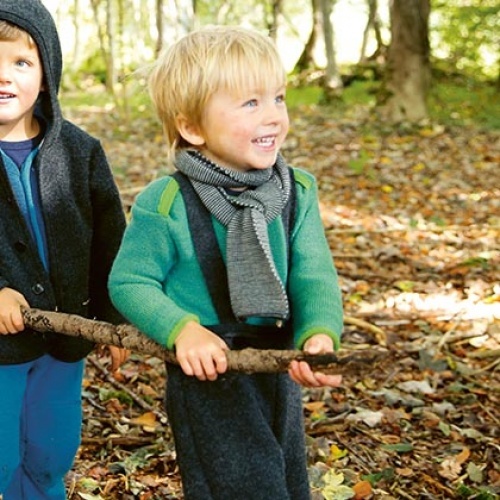 In fine-knit organic Merino wool, these round-necked, long-sleeved vests will keep your child warm whatever they're up to. 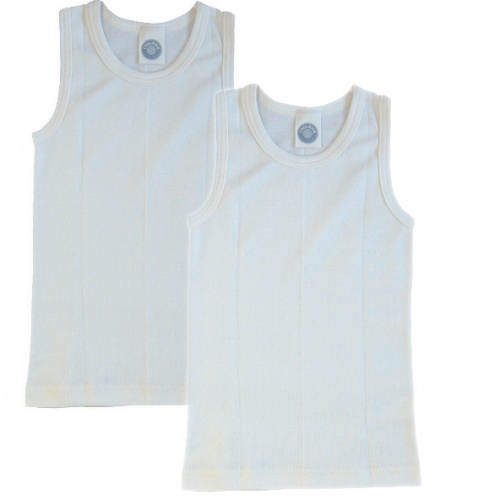 Wonderful value simple organic merino wool vests in a very pure form, but wash carefully. 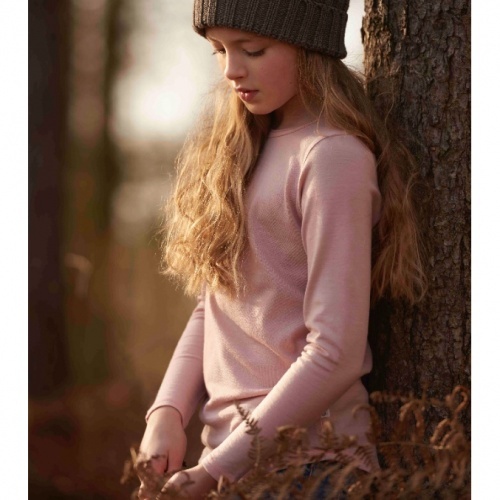 A beautiful, comfortable, all-season, staple children's long-sleeved vest top. 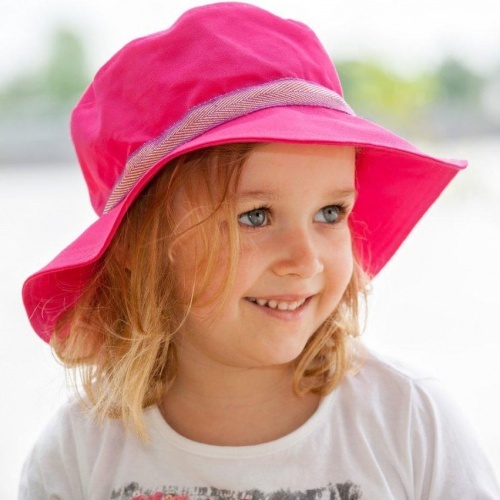 The natural, chemical-free fabric helps your child's body regulate temperature. Wear either as a vest or a light top. 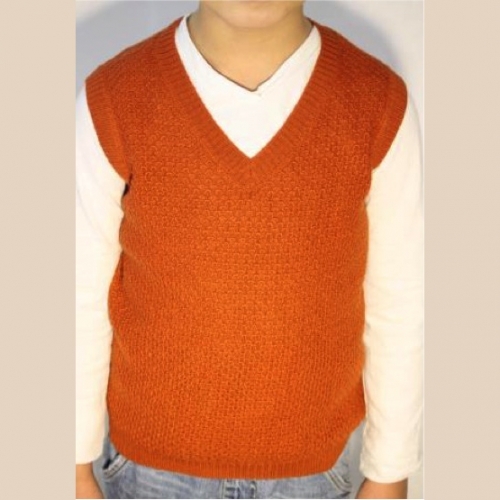 A long-sleeved vest top in fine knit Merino wool to keep your child warm and snug whatever the weather. 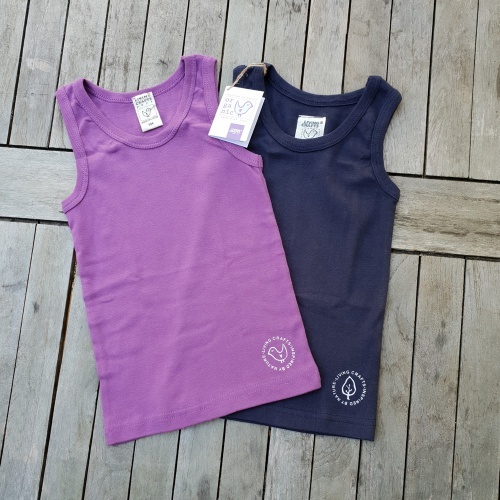 Organic cotton has a long, smooth fibre and so is gentle on the skin, making these natural children's sleeveless vests more comfortable to wear. Great on their own or as a base-layer. A lovely and comfortable sleeveless vest in soft organic cotton with a crocheted trim - simple and perfect! The trim and fine rib knit are even prettier and more pronounced than in the photo (you'll agree when you get it!). This is one of our loveliest straightforward, best-selling vests. A few wonderful things that nourish a healthy growing body where it's most important: right next to the skin. In super-soft New Zealand merino wool, perfectly designed and finished, these sleeveless vests do what's needed, beautifully. Luxury woollen everyday wear for kids. This beautifully designed and finished, soft merino wool camisole vest is nurturing and long-lasting. Luxury everyday wear which is good for your child's well-being as it nourishes the skin and growing body. The perfect all-season short-sleeved striped tops. 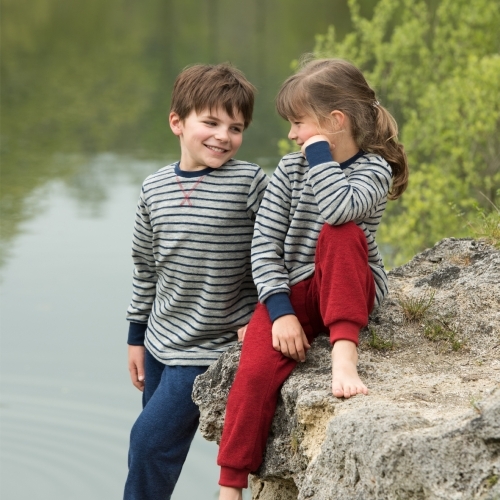 In a soft, non-itchy blend of Merino wool and silk, they will keep your child snug and comfortable. Useful in warm weather as well as with long-sleeved tops in Winter. A simple, staple, quality short-sleeved t-shirt that can be worn as a vest or top. These lovely short-sleeved vests are made from a wool and silk blend to create Engel's wonderful, breathable next-to-the-skin fabric. Wear as a top or a base-layer. The silkiest smoothest vest ever in pure organic silk. Our best selling all-silk baby vest is now available in larger sizes! A plain and simple long sleeved vest top in un-dyed organic cotton. With rounded hems, a longer back, contrasting stitching and completely label-free, this delicious merino wool vest does what it should and more: nourish your growing child and be beautiful at the same time. 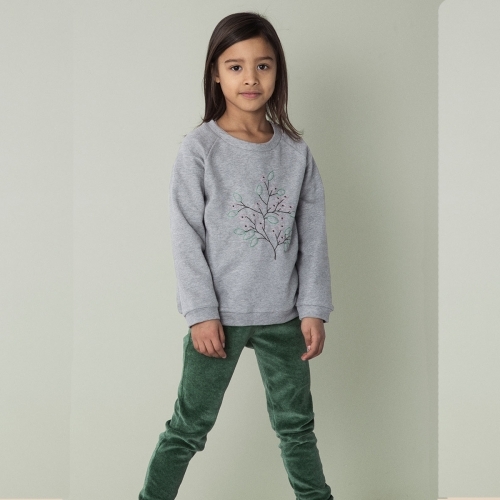 Ethically-made, luxe wool everyday wear for kids. 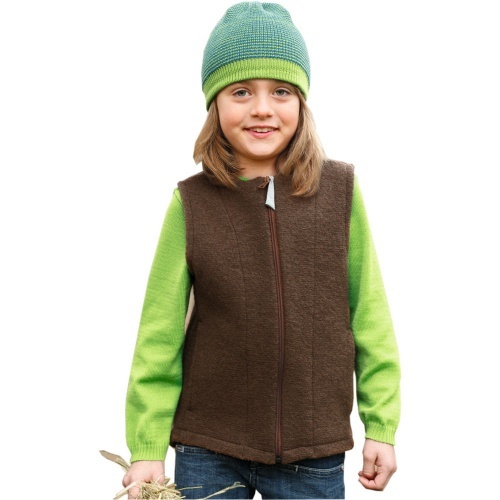 A soft and light children's vest with long-sleeves and a round neck. Soothing for sensitive skins and eczema sufferers. 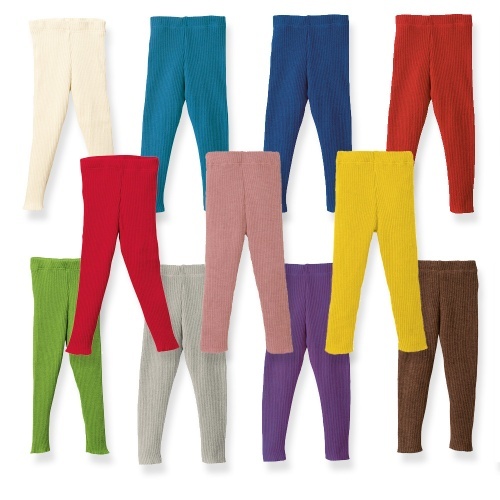 Comfortable kids' long johns/leggings in beautiful colours, and soft organic wool for the comfort of little legs! 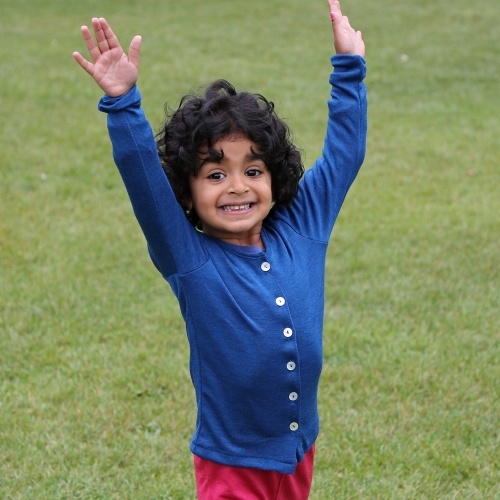 A highly-recommended base-layer for children. 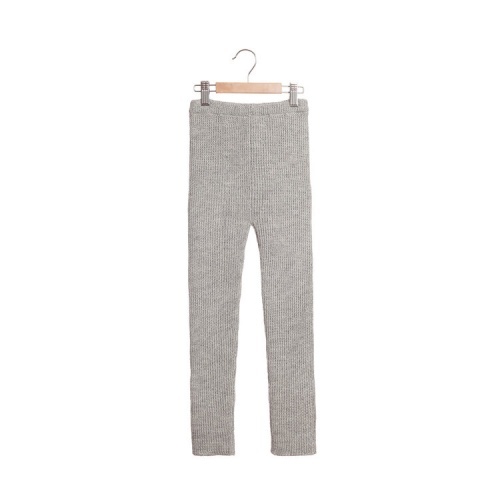 Our softest silk and organic wool long-johns! 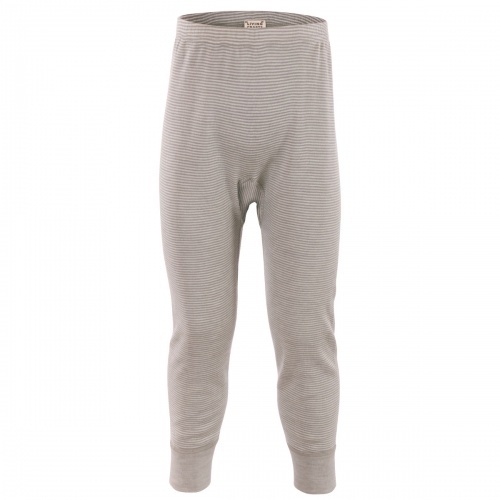 These mightily soft long-johns are great on their own or as an extra layer of warmth. Merino wool and silk gives an optimal combination of warmth, gentleness and breathability. 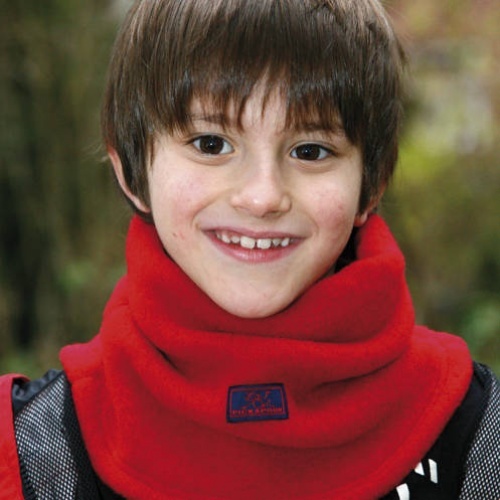 The silkiest softest underlayer for your child which will keep them warm without over heating or irritating the skin. 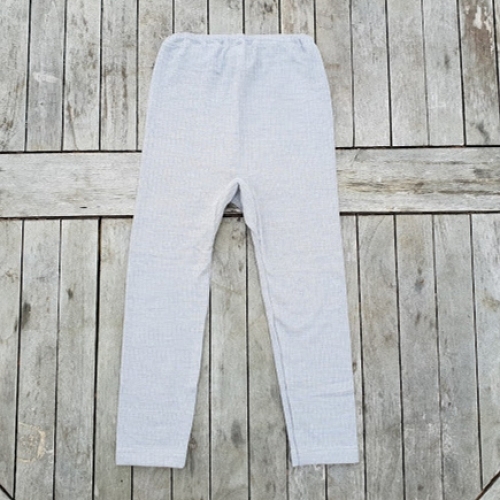 2 pairs of girl's pants in fine organic ribbed cotton in a lovely blackcurrant colour. 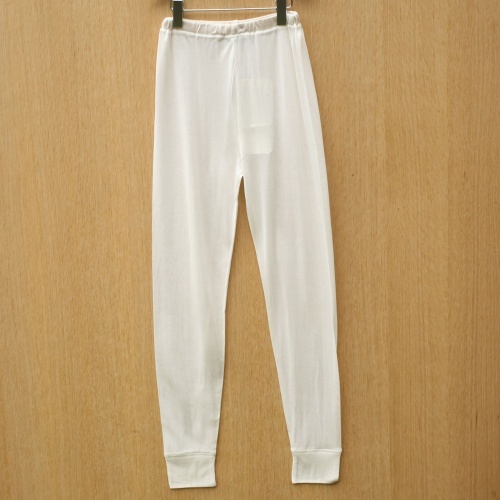 These organic girl's pants are good quality and straight-forward. They are classic, logo-free, comfortable girl's pants with a crocheted lace trim, and with our matching ribbed cotton vest, form a lovely underwear set. 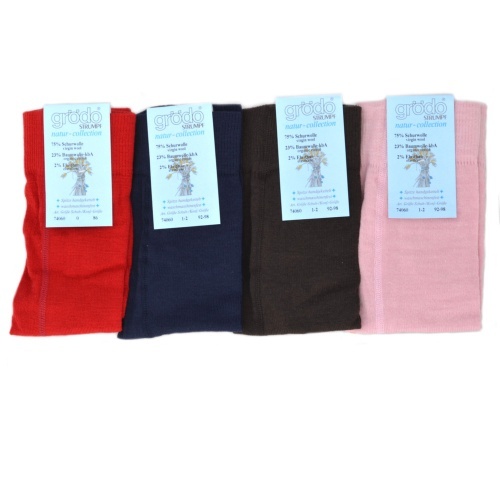 Three pairs of plain and simple boys underpants in pure and soft organic cotton. 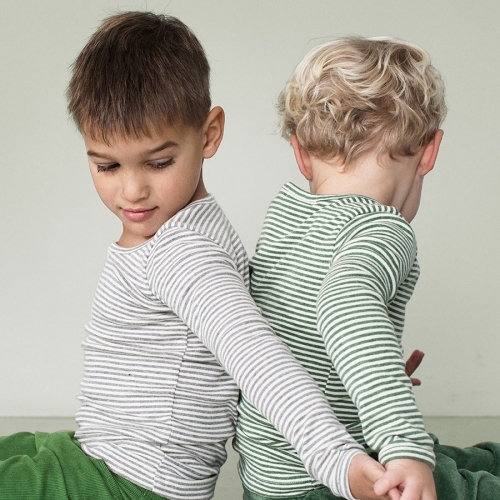 Proper, comfortable boys' briefs in soft, organic cotton. 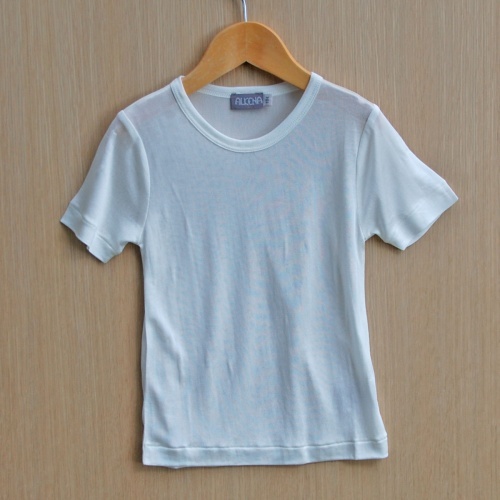 Good quality organic cotton is gentle on the skin and very comfortable to wear. Natural comfort for everyday wear! 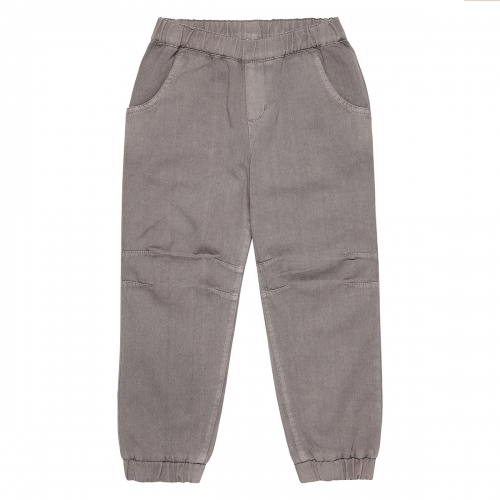 Comfortable, soft, good quality organic cotton pants for boys and girls. Gentle on the skin and very comfortable to wear. Soft, simple and comfortable boxer shorts in ethical organic cotton. 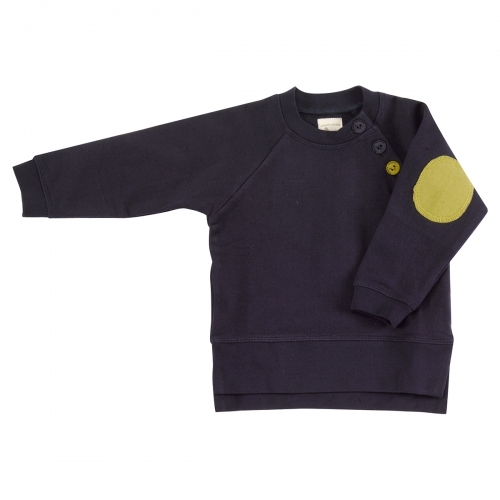 A warm and cosy long-sleeved baby-body made from breathable, natural Merino wool. Wool is thermo-regulating so this baby-body will help your baby to maintain a steady safe temperature throughout the day and night. 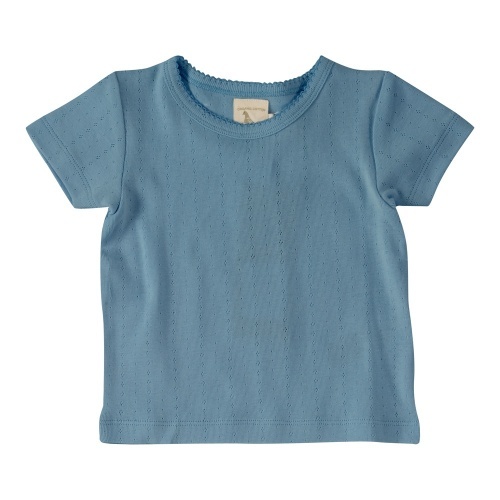 This organic wool/silk sleeveless baby-body is one of the most comfortable, and practical baby-bodies out there. The variable popper positions accommodates a washable nappy and your baby growing. 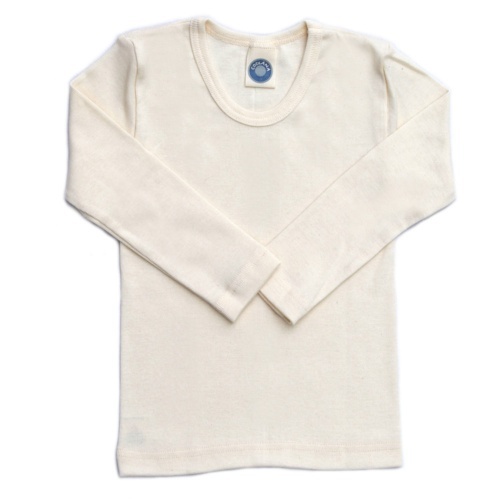 Our softest round neck organic Merino wool and silk baby body, with buttons at the shoulder for easy fastening. The chemical-free nature of this product - including its brass poppers! - is helpful for those with sensitive skin, and the label at the neck is also easily removed. 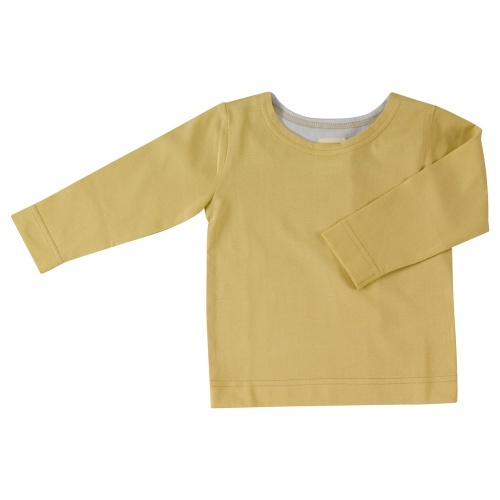 A long-sleeved, envelope-necked baby-body in organic Merino wool. Use as an underlayer on cold days and on its own on warmer days. Soft, well-designed and practical - a winner! We recommend you size up! 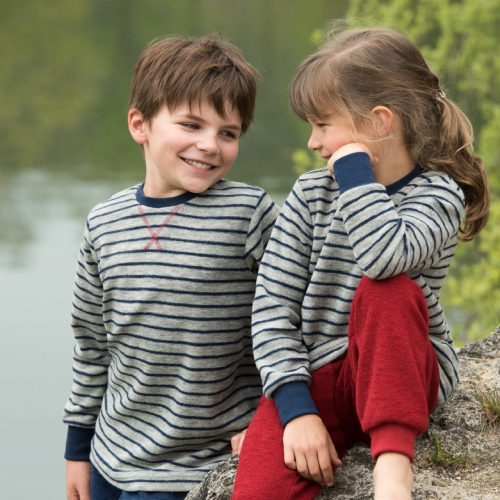 Beautiful, comfortable and practical pyjamas your child will want to live in. 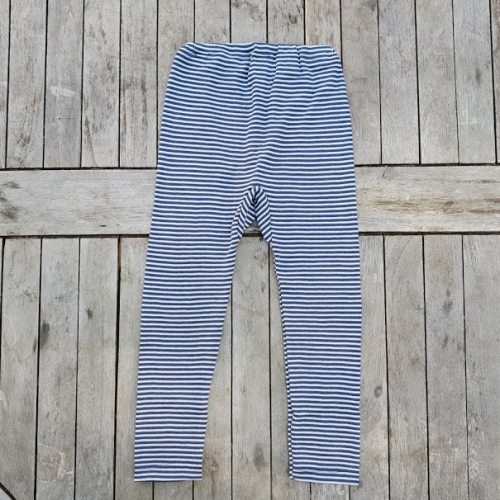 Our best-selling cotton pyjamas are now also available in grey stripes! Soft and comfortable stripy long-sleeved 2-piece pyjamas with a long-sleeved stripy top and plain bottoms. 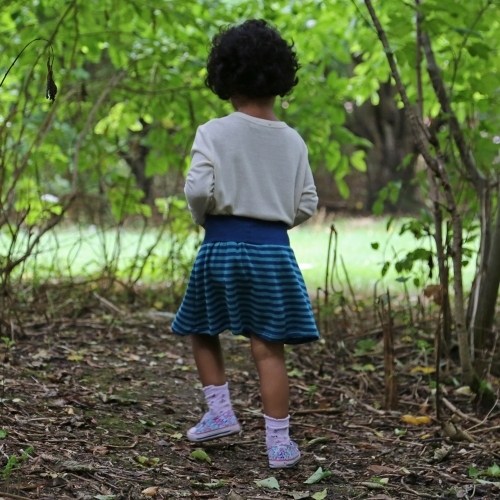 The cuffs at the wrists and ankles can be rolled up if they are a bit big, and the trousers won't ride up your child's legs in the middle of the night. 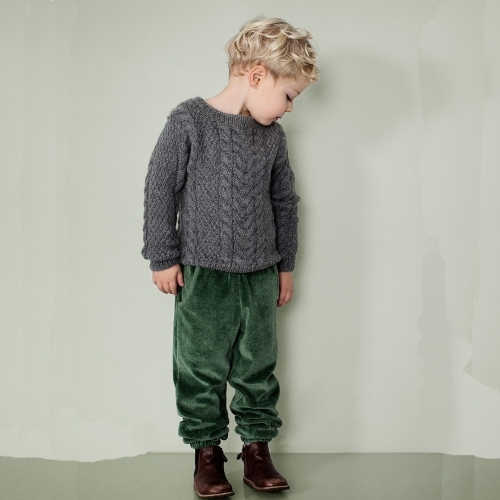 A practical, organic wool pyjama set for boys and girls of all ages. Organic Merino wool is warm yet breathable, and research shows it supports healthy sleep too. Very soft, gentle pyjamas to sleep in, wear around the house and outdoors too! Perfect! Practical, good looking and long-lasting trousers for boys and girls, for all seasons. 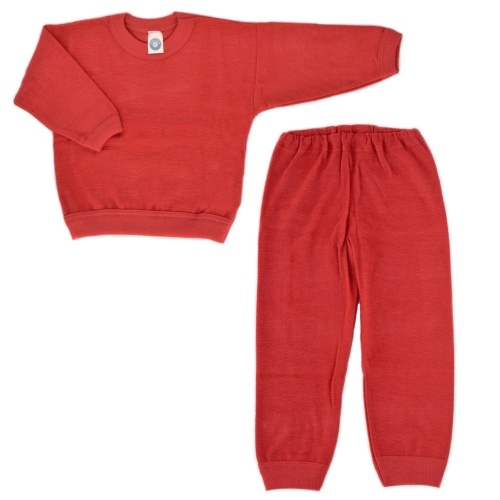 Ideal baby and toddlers' pyjamas as they are soft and gentle on the tummy. 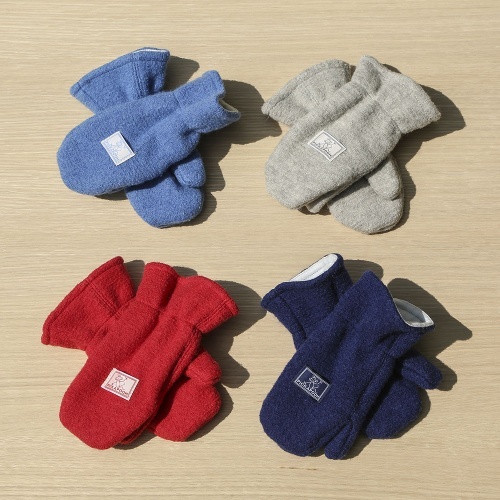 Wonderful Merino wool keeps bodies comfortable, giving your little one a more relaxing, deeper, healthy nights sleep. Warm, natural and breathable for healthy skin. 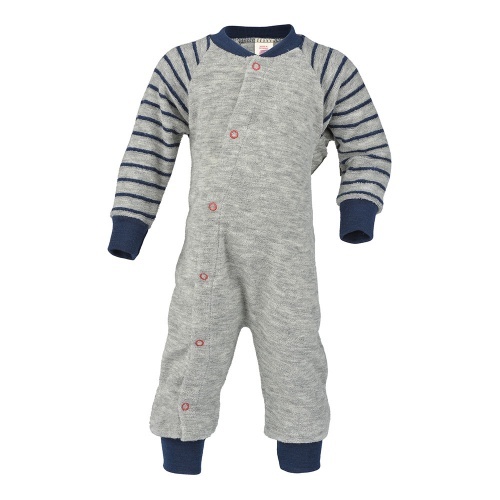 A wonderful sleepsuit for babies / cosy wool onesie for children, made from warm and soft Merino wool terry. No feet - safer for toddlers and young children to get about and it will last longer, too! 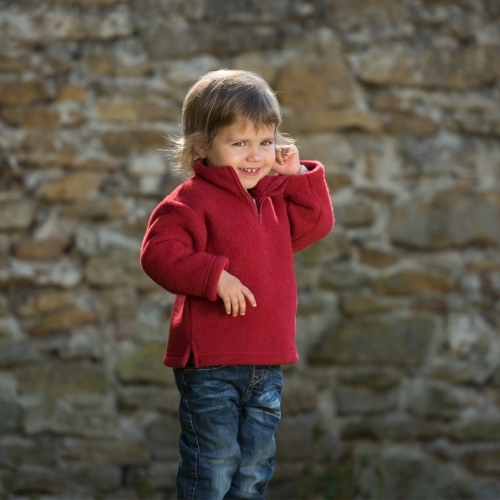 Our most popular organic Merino wool all-in-one! Wonderful natural pyjamas with embroidered woolly sheep, which doubles as a warm and comfy babygrow. Give your little one a more relaxing, deeper, healthy night's sleep. Gorgeous knitted sleeping bag in natural, breathable Merino wool which will help your baby relax and can promote healthier sleeping patterns. That's why it's one of our best sellers! allows feet to safely wiggle - no opening at the bottom! Stop press: Disana make the Size 3 sleeping bags exclusively for Cambridge Baby! Sizing The measurements are taken at the maximum length and you can adjust the position of the buttons on the shoulder strap. Please bear in mind that with repeated washing, the bags will shrink a little. A very well designed and practical baby sleeping bag. 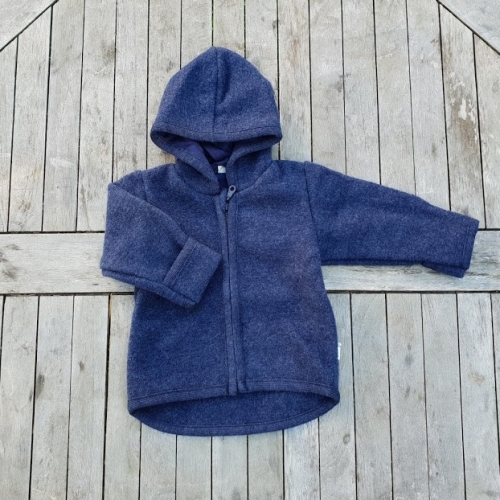 With a knitted Merino wool outer layer, and lined with organic fleecy cotton velour - ideal for cooler nurseries. 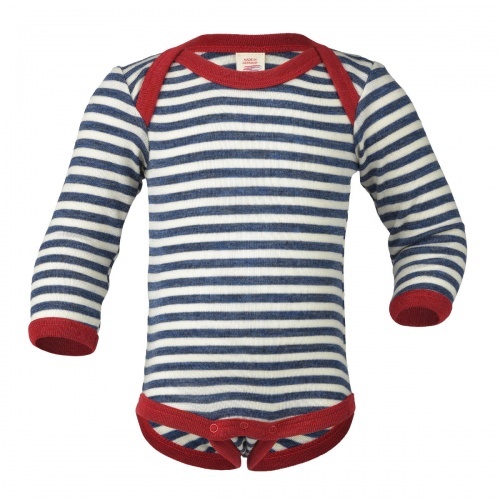 Wear with just a nappy on or a baby-body depending on temperature. A Summer Special for our customers! We bought these in the winter and would like to offer them to you at the special rate of just £5.00 each!!! Very soft and comfortable sleeveless tank top. Using GOTS certified organic cotton means ethically-made tank tops, for people and the planet!! Lovely sunny light purple colour with Living Craft Inspired by Nature logo. 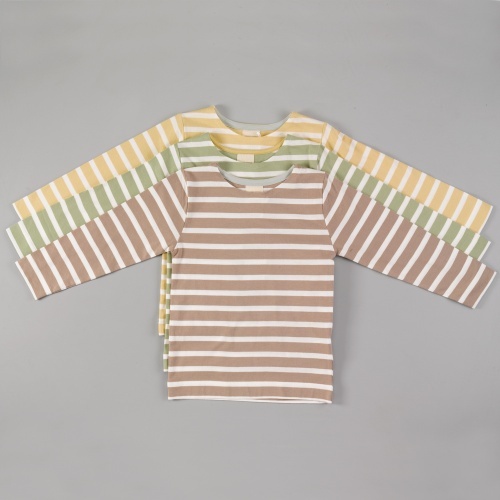 A beautifully-made child's light woven peasant shirt in comfortable super soft organic cotton. Perfect for everyday wear or for a smart occasion. 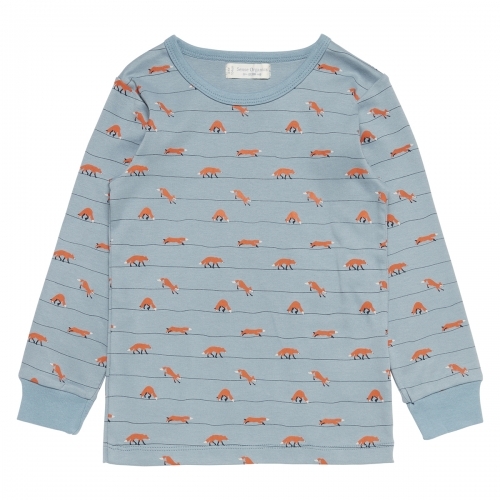 A beautiful and super-soft and comfortable woven organic cotton long-sleeved top. 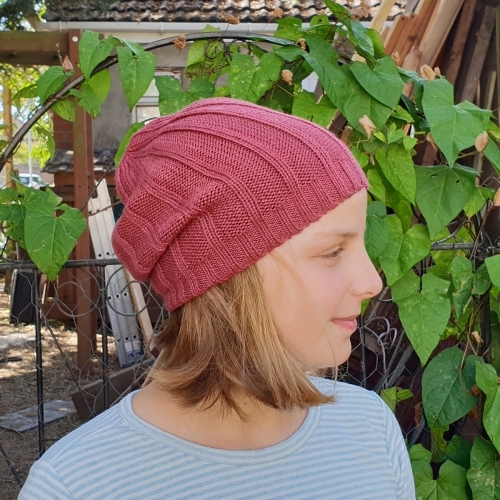 The woven organic cotton is a light and cool fabric and comes a a lovely pale salmon pink with gathered neck, raglan sleeves & a shell button at the back of the neck. We love it! 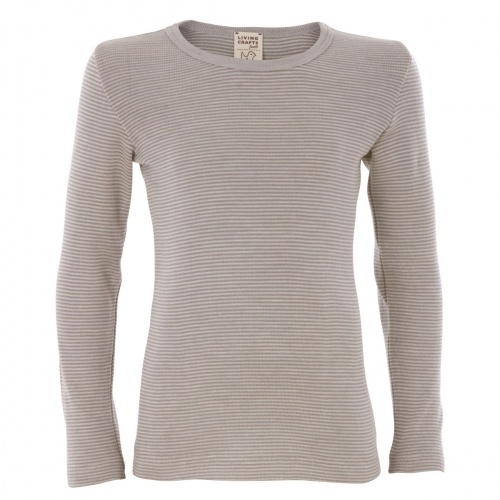 A beautiful and super-soft and comfortable waffle long-sleeved top. The waffle organic cotton is thicker and warmer than a jersey fabric and comes a a lovely mustard and storm blue with two coconut buttons on the central placket. We love it! 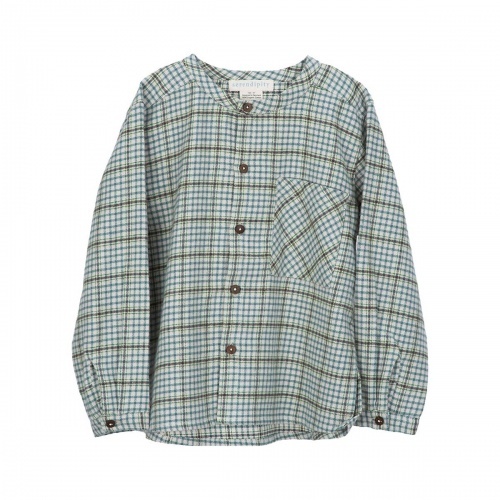 A beautifully-made child's checked peasant shirt in comfortable super soft brushed organic cotton. Perfect for everyday wear or for a smart occasion. 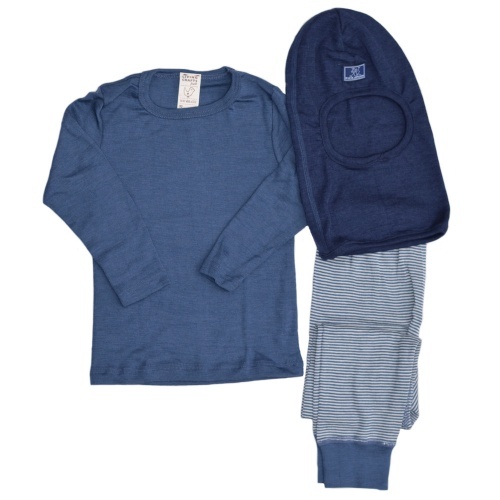 A simple & comfortable sweatshirt top with contrasting elbow patches from Pigeon in super soft 100% organic cotton sweatshirt material. Well made and available in 2 beautiful muted colours, Three buttons on the shoulder for easy dressing, one contrasting button to match elbow patches & Pigeon logo . 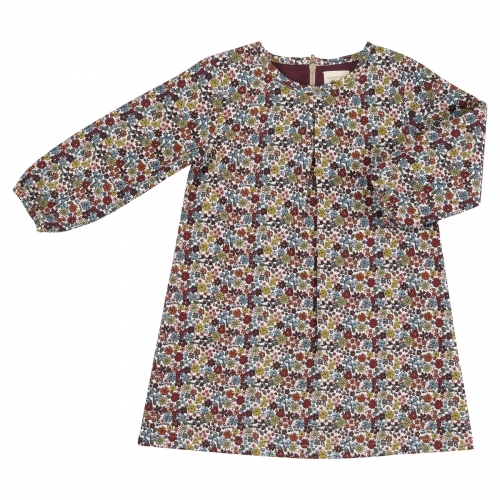 A lovely floral pattern smock top in soft organic brushed cotton. A beautiful raglan sleeve top, with smocking detail on the yoke, three button placket on the back and gently elasticated sleeve cuffs ! 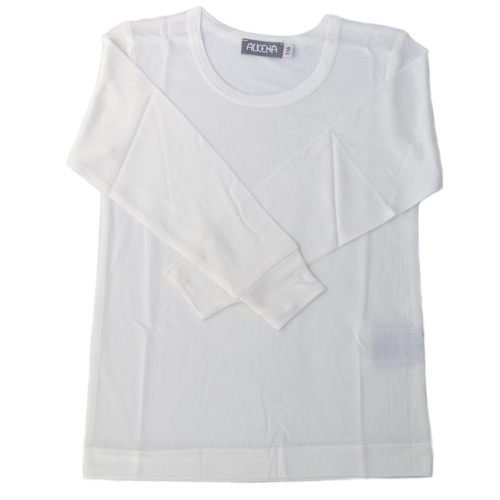 A simple long sleeved t-shirt from Pigeon in comfortable 100% organic cotton. Well made and available in 6 beautiful muted colours, this t-shirt is an easy addition to most outfits from spring right through to autumn. 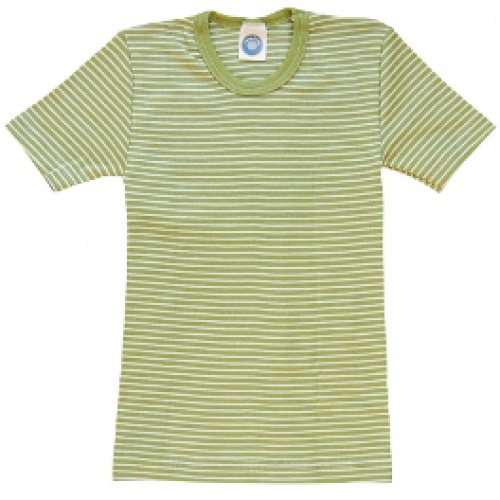 A 100% organic cotton short sleeved t-shirt from Pigeon's stylish spring/summer collection. The pretty pointelle detailing and stitching on the round neckline will look great in the sun this summer. 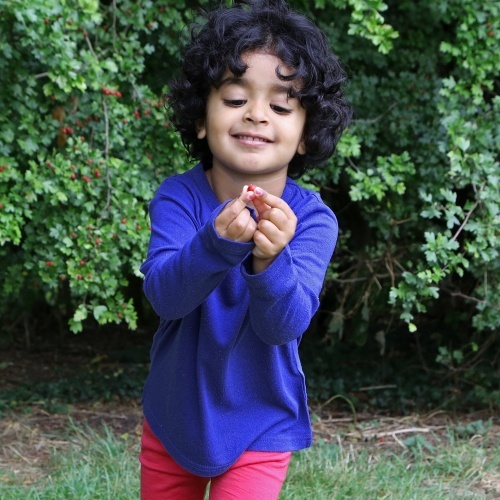 A beautiful long-sleeved top in soft organic cotton. A beautiful treat to wear every day. 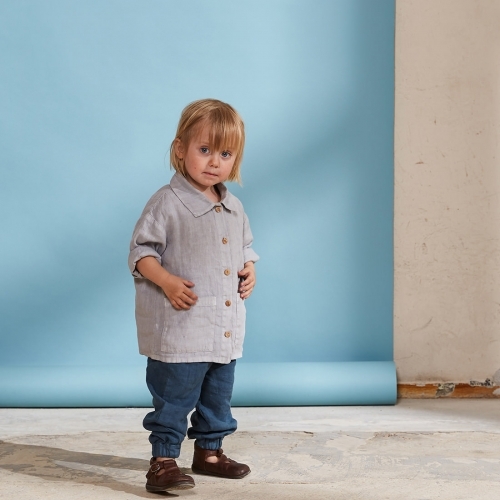 We couldn't help but offer our customers the Matona range, we just love the fabric quality, beautiful designs and feel that Matona truly fulfil our brief of offering sustainable natural healthy fabrics in comfortable and practical designs that can be handed down through your family.. A beautifully simple shirt for girls and boys too. We recommend you buy a larger size and roll up the sleeves to get maximum wear! 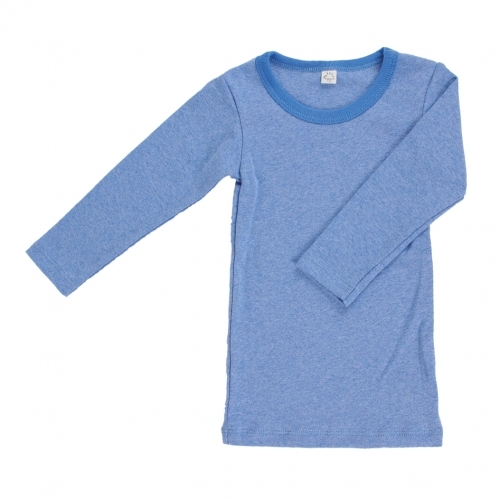 A beautiful Danish style, long-sleeved top in soft organic cotton. A beautiful treat to wear every day. 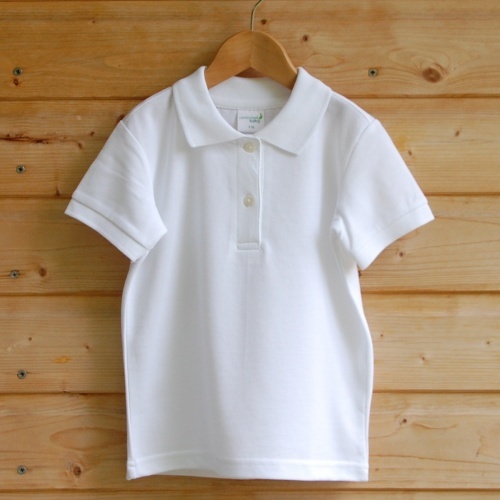 The loveliest ethically-made white cotton polo shirt ever! Perfect for school uniform or special occasions in pure organic cotton this top is soft, comfortable and has no nasty chemicals in or on it. A plain un-striped version of our best selling Cosilana vest top. A perfect short-sleeved t-shirt for layering and all-year round wear. 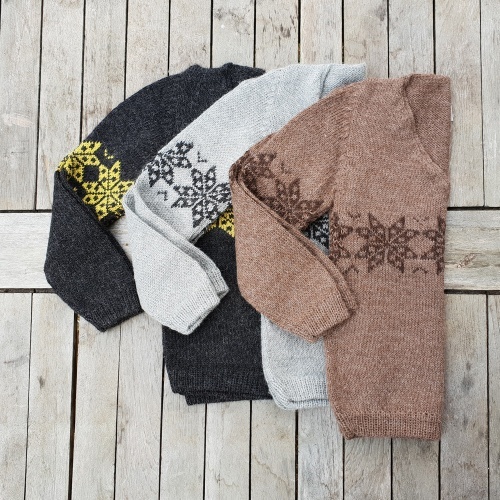 A gorgeous jumper in super-soft Alpaca which will quickly become an everyday favourite. Combining simplicity with style, this organic merino wool jumper has a lightweight knit and a natural fit to work with the body. 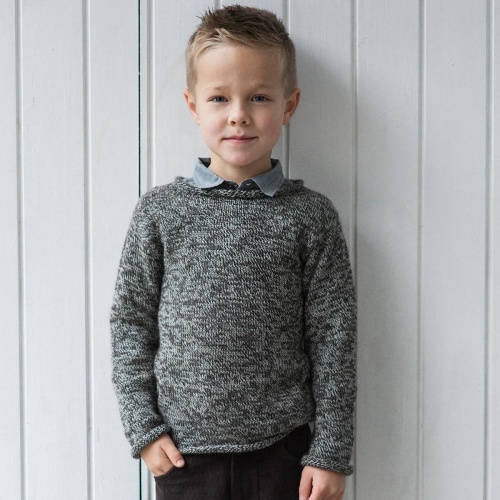 Very much a good quality wool layer for everyday that your child will feel and look good in. 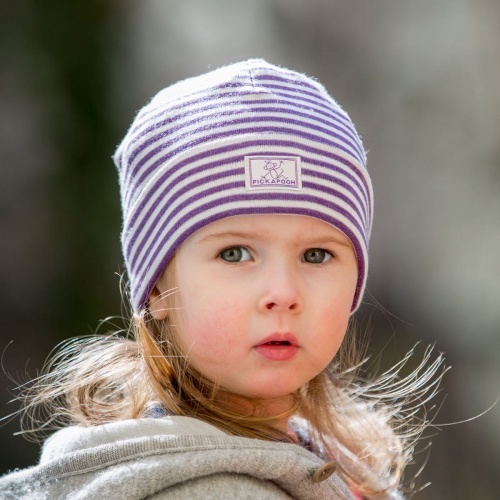 naturally warm 100% organic Merino wool, GOTS certified. great for layering and adding warmth without bulk. Soft and light yet warm and breathable, this baby sweater is easy to put on over other clothing and flexible enough for slings. A staple garment! dirt brushes off easily - seldom needs to be washed! 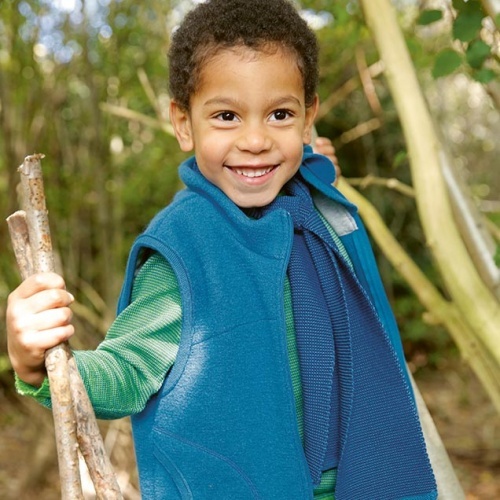 Pickapooh's super practical, easy to wear and great for layering boiled Merino wool sleeveless pullover/bodywarmer. 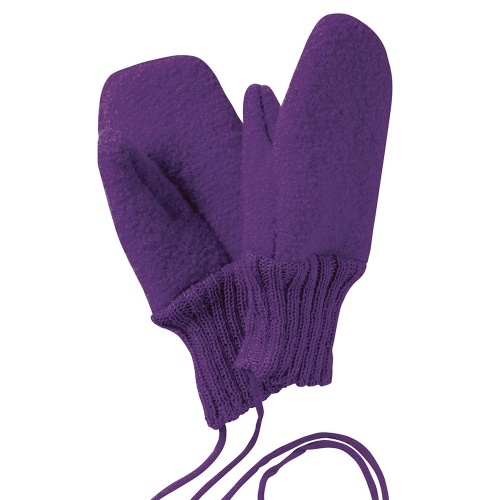 Keeps your little ones warm and comfortable with easy movement. Beautifully made, simple design, great with leggings, trousers or skirts. Handmade knitted jumper in super-soft baby Alpaca with old-fashioned pierrot clown collar. Delightful, semi-handknitted jumper that's warm and light, chunky knit, not bulky yet very warm, because it's alpaca. 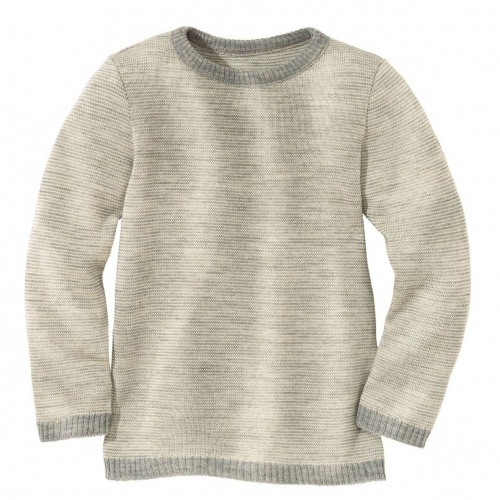 Scandinavian style in a knit that's soft and delicious for your child. dropped shoulders and lovely turtle neck in heathered grey. 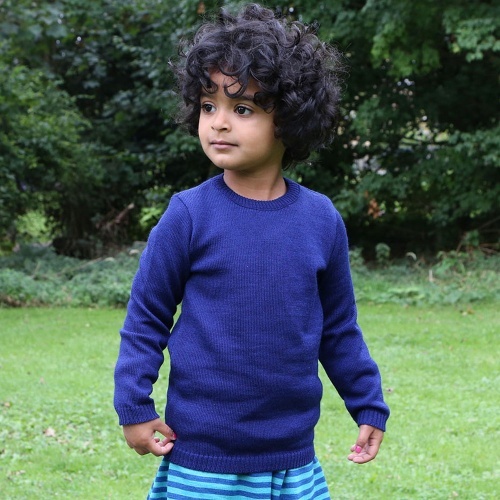 This beautiful children's jumper is made of 100% soft Baby Alpaca wool. 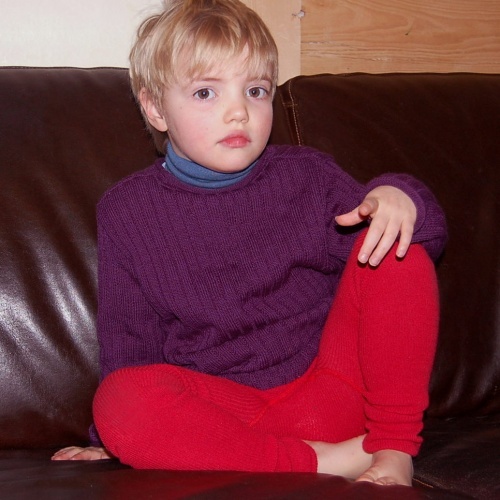 It is a very soft and cosy jumper with a rolled neck and cuffs, finishing below the hip. It is really warm and cosy without being bulky. A beautiful children's waistcoat in the softest Baby Alpaca, warm, but light! a waistcoat is one of the best ways to layer up to keep nice & cosy! 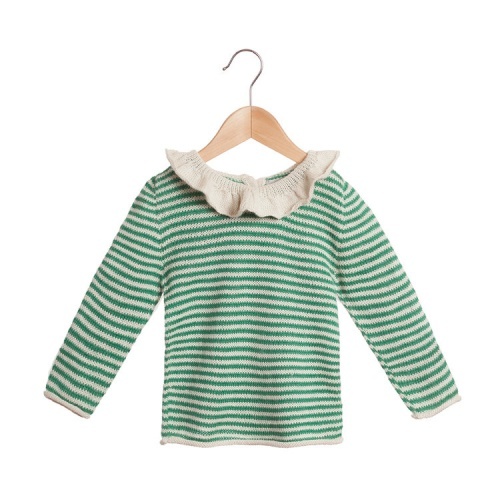 A beautiful striped children's jumper in the very softest Baby Alpaca. 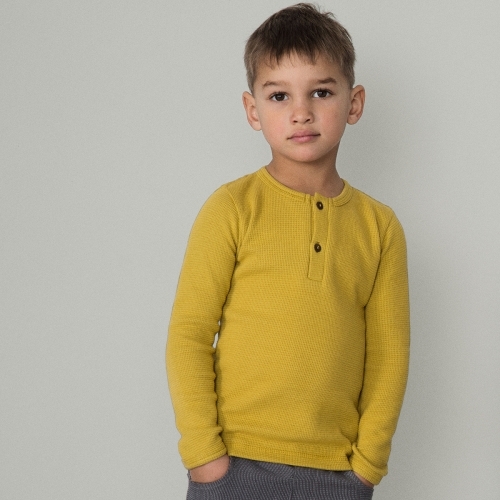 A beautifully-made, practical, round-neck children's jumper in breathable Merino wool with contrasting collar and cuff colours. A unisex staple garment, all year-round. Practical, lightweight sweater knitted in pure Merino wool - one of our best sellers. A gently stripy and really comfortable sweater that can even moonlight as a pyjama top! 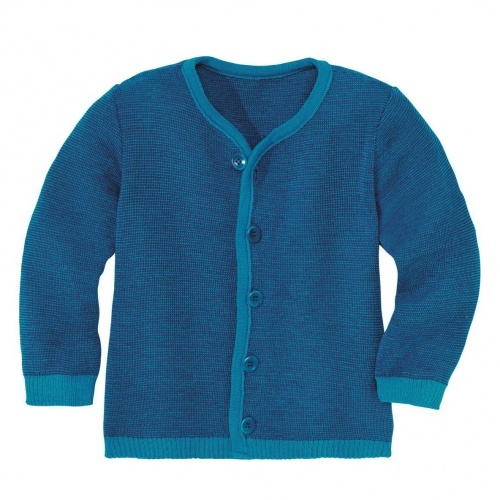 A simply beautiful yet practical all-seasons child's cardigan. 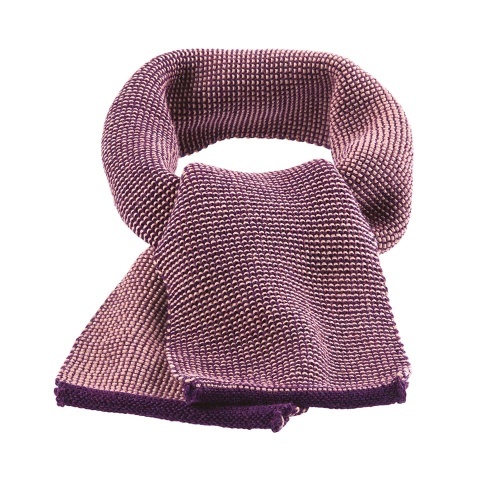 Its fine-rib knit combines the breathable warmth of wool and the softness of silk, in stunning colours too! 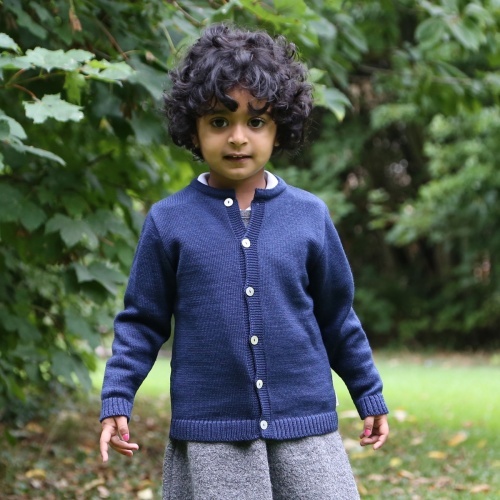 A beautifully-made, expertly-finished baby and child cardigan in 100% fine Merino wool, with pearl buttons. A sober yet beautiful, timeless design. 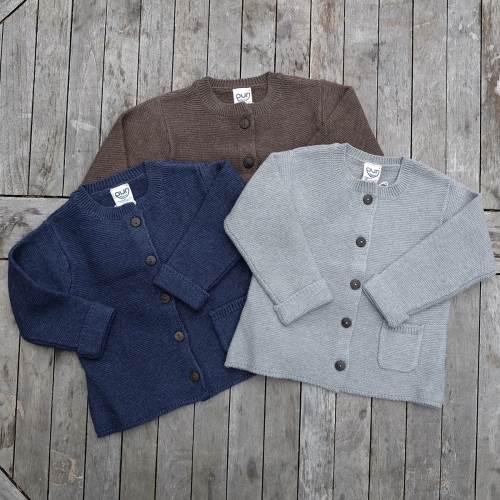 A simple but smart jacket/cardigan in organic cotton and wool with turned over cuffs and a patch pocket. All the softness of organic cotton with that extra bit of warmth from the wool. 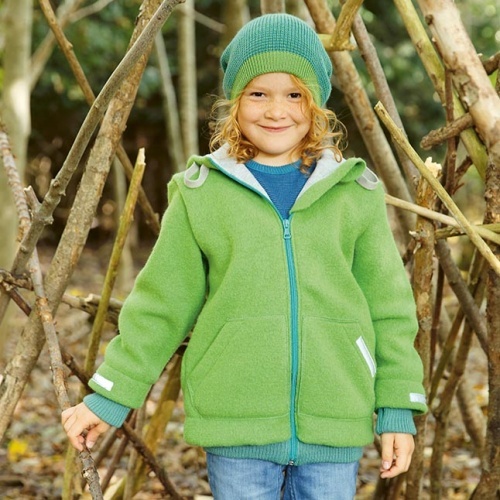 Made to Reiff's high standards, this organic fleeced Merino woolzip jacket is very warm and soft, which makes it ideal for outdoorsy kids! 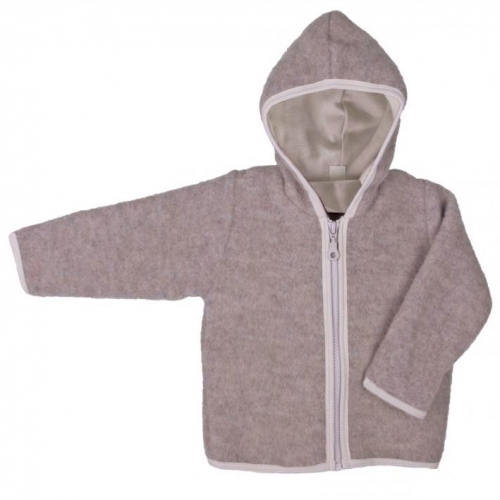 Toddlers and children will love this soft, practical, expertly designed and very comfortable hooded fleece jacket. 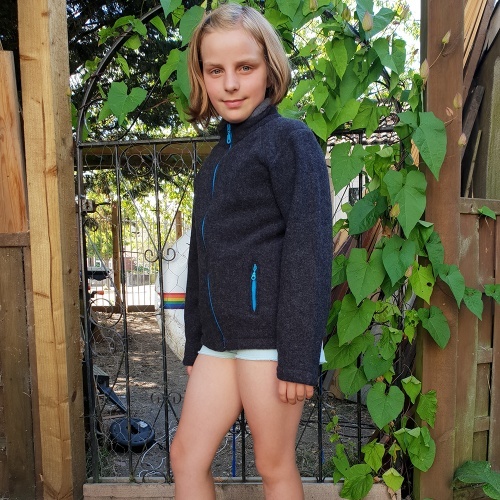 Made to Iobios high standards, this organic tumbled Merino wool zip jacket is very warm and flexible, which makes it ideal for outdoorsy kids! 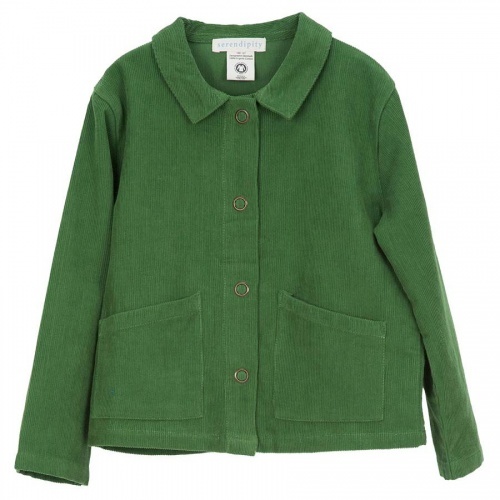 Soft organic corduroy jacket with everlasting appeal.This beautiful jacket is extremely practical for growing children, as it can be worn larger with the cuffs rolled up and is great for layering from Autumn through to Winter. Practical and beautiful in its Scandinavian quality and simplicity - thank you Serendipity! New Design! Soft and warm but sturdy and breathable, a fitted gilet quick to put on for an extra layer of body warmth. Rugged enough for outdoor play yet light to wear and comfortable. Try it - love it! 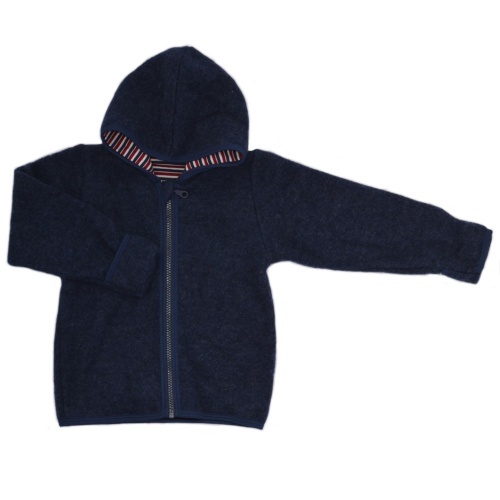 Toddlers and children will love this soft, practical, expertly designed and very comfortable hooded fleece jacket.Please note that the navy melange jacket has plain navy lining in the hood as opposed to stripy blue which is shown in the photo. Now end-of-line in pink, green and blue! 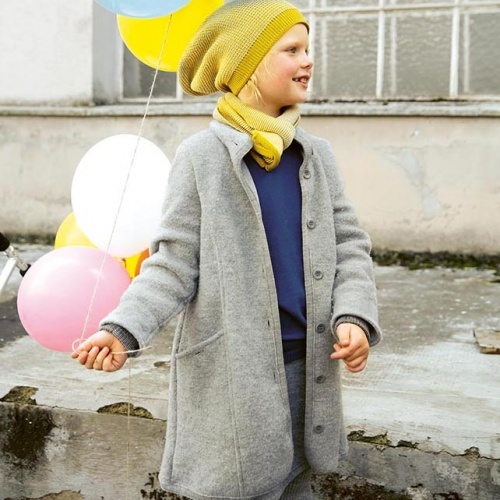 A gorgeous classic girl's coat in boiled organic merino wool which combines style with warmth and comfort. 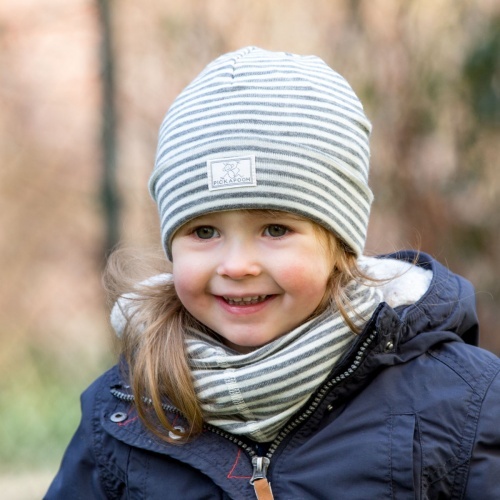 Keeping your little girl warm are the knitted wool cuffs to keep the wind and snow out, the high collar providing protection and comfort with its cotton lining, and the semi-belt at the back for a closer fit. Its elegance combines with a fantastic fabric for durability, softness and warmth. 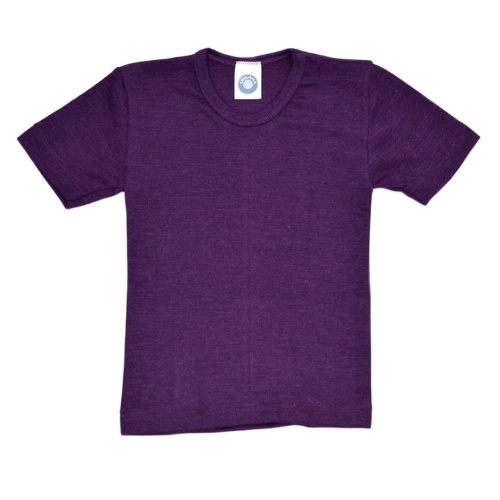 Semi-lined for comfort in organic cotton to the front and back plackets and collar too. a good lasting length and versatility in one organic wool coat. Funky-looking, versatile knitted legwarmers in soft organic Merino wool. Great for nappy changing : they don't cover the nappy, so you don't have to take them off at every nappy change. Ideal for potty training too as little ones can just sit down. 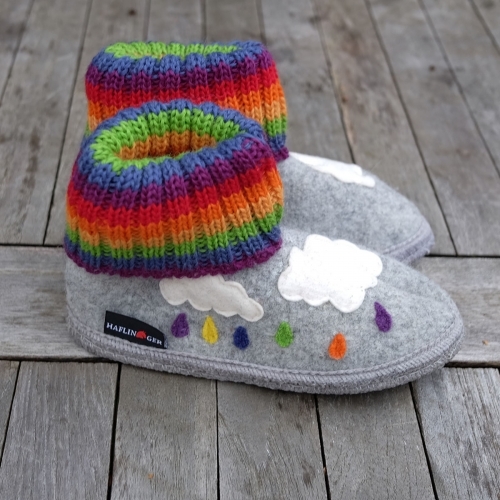 They're practical and fashionable for older children to keep legs and ankles warm. can be used as anklewarmers after that! 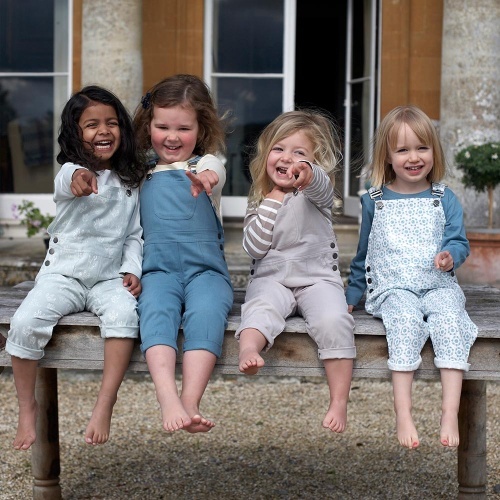 We couldn't help but offer our customers the Matona range, we just love the fabric quality, beautiful designs and feel that Matona truly fulfil our brief of offering sustainable natural healthy fabrics in comfortable and practical designs that can be handed down through your family.. A truly wonderful jumpsuit for toddlers and children too. 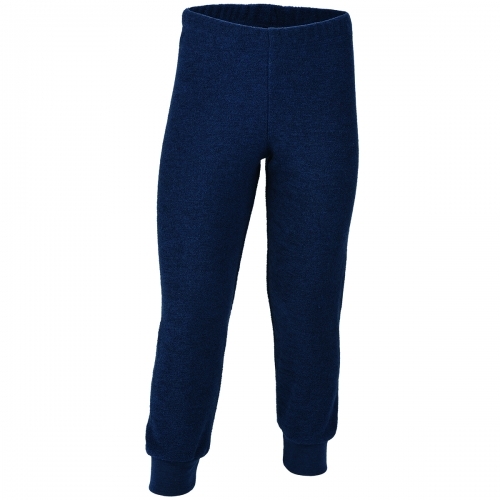 Made to Iobios high standards, these organic tumbled Merino wool crawler pants are very warm and flexible, which makes it ideal for outdoorsy kids! great for crawling & exploring inside & out! 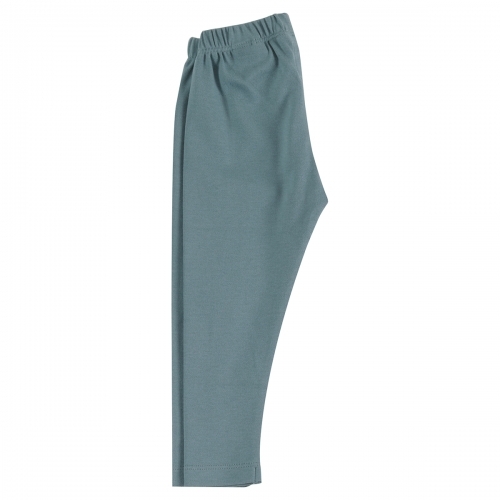 Soft and comfy Tango pant trousers from Sense Organics. Perfect for every child's adventures! 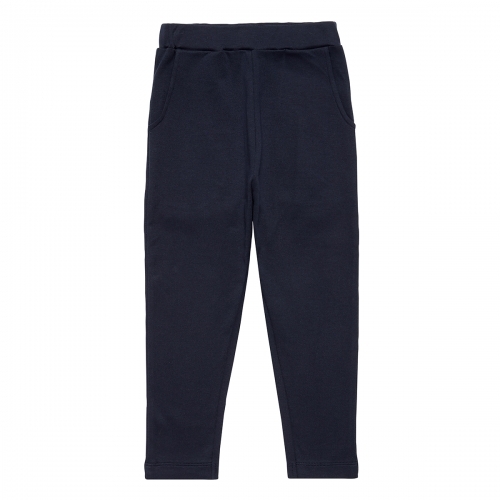 These practical & cosy trousers in soft organic cotton twill are fully lined for extra softness and comfort. 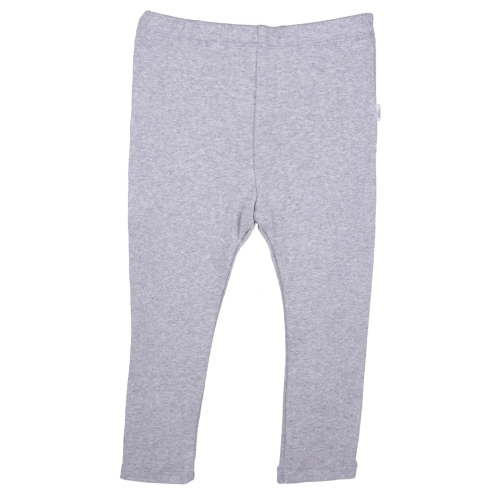 A simple & comfortable slouchy joggers from Pigeon in super soft 100% organic cotton sweatshirt material. Well made and available in 2 beautiful muted colours, . 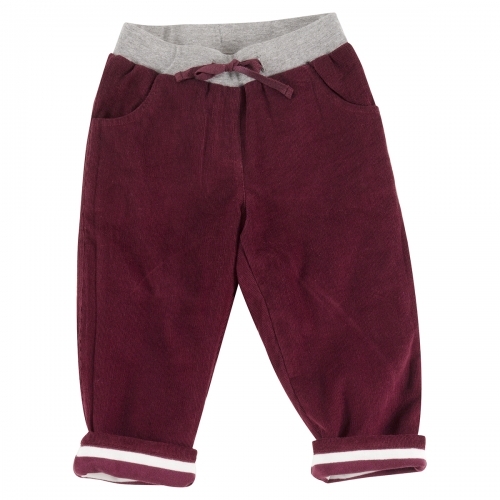 These practical & cosy trousers in soft organic baby cord are fully lined for extra softness and comfort. 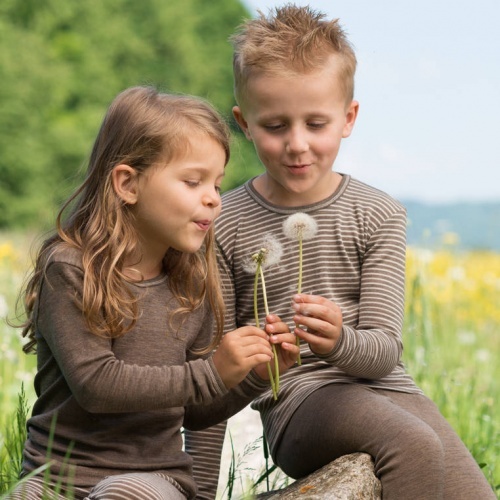 We couldn't help but offer our customers the Matona range, we just love the fabric quality, beautiful designs and feel that Matona truly fulfil our brief of offering sustainable natural healthy fabrics in comfortable and practical designs that can be handed down through your family.. Lovely pants for boys and girls. These beautiful, practical everyday dungarees have a high back for warmth and the smaller sizes have poppers for easy changing. 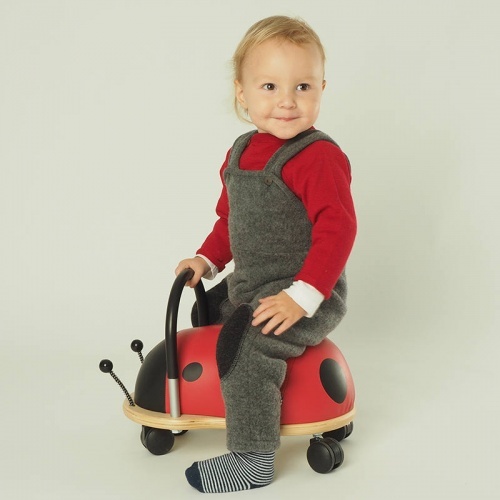 The cotton cord is flexible, so babies and toddler can roll, crawl, sit, walk and wiggle comfortably. Now also in super stripes! 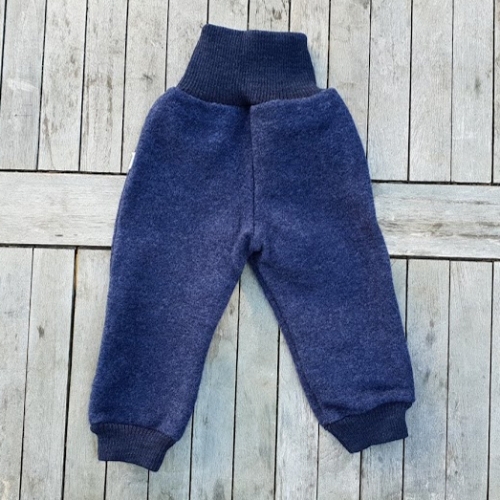 With a gentle waist band and cuffs at the ankles, these soft Merino trousers give freedom for your baby to wriggle and toddler to clamber. Comfort for indoors and out, for play or sleep. Perfectly flexible and un-take-off-able! Girls and boys love them. 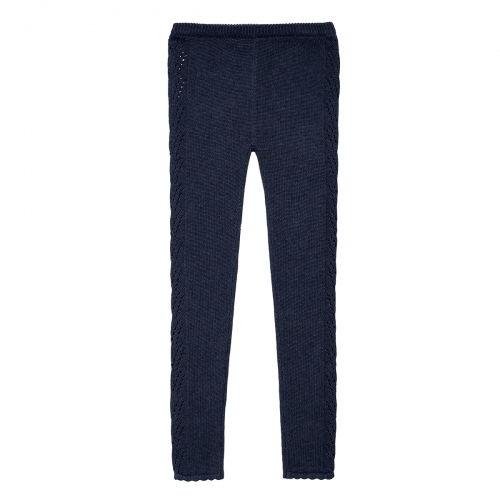 Very, very soft and warm fleecy Merino wool trousers. Durable and water-resistant enough for outdoor wear, on their own or over other trousers / leggings for extra warmth. Comfortable all day long. great as good breathable insulating layer - even when damp! Made in Serendipity's gorgeous needle-out velour, these soft trousers are just the thing to pull on to be comfortable all day long. 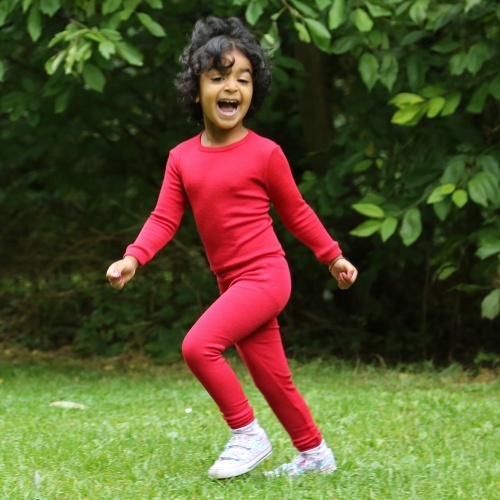 We love the ethics and quality of Serendipity's clothing and their velour pants are practical and lovely too. 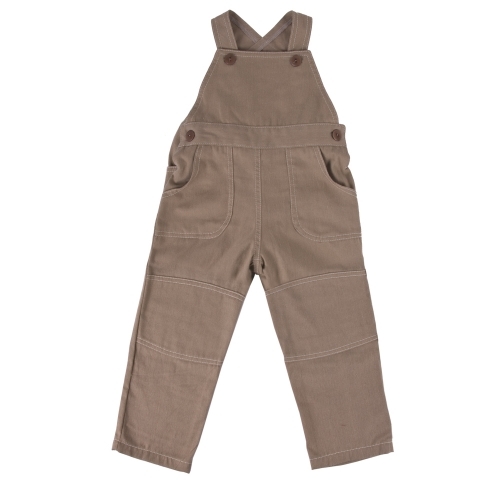 Iobio twill farmer dungarees, made from 100% certified cotton twill, are the ideal all-round-pants. This popular material is characterized by its pleasant wearing comfort and high dimensional stability. The straps are equipped with 2 wooden buttons (ivory nut), whereby the size of the dungarees can be easily adjusted. Two further wooden buttons on both sides ensure easy dressing. Two sewn pockets give the dungarees a cool look. The sewn trouser pockets ensure the casual look and provide storage for found treasures. Extra fabric layers and strengthening at the knees, make them hardwearing and particularly suitable for playing. 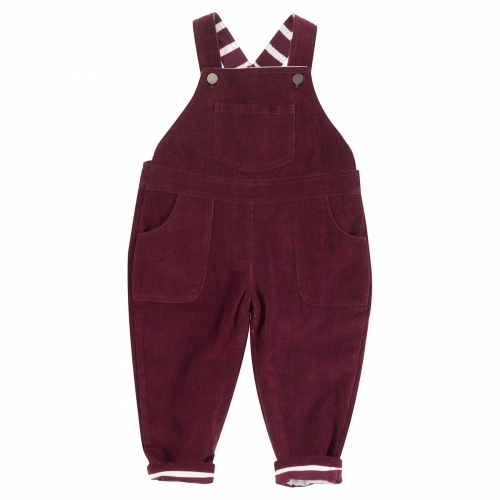 These pretty and cosy dungarees in soft baby cord are fully lined for extra softness and comfort. 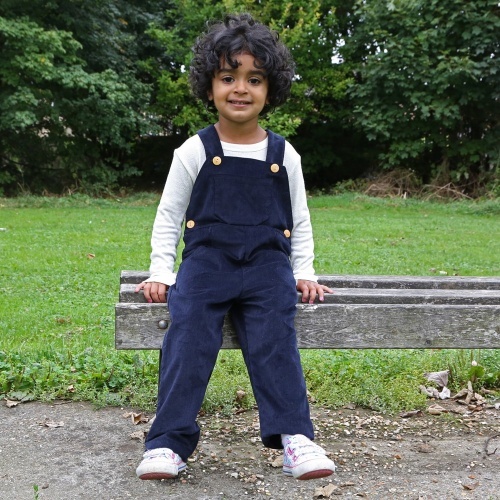 A beautiful simple and practical slouchy dungarees in super soft organic cotton. A beautiful treat to wear every day. 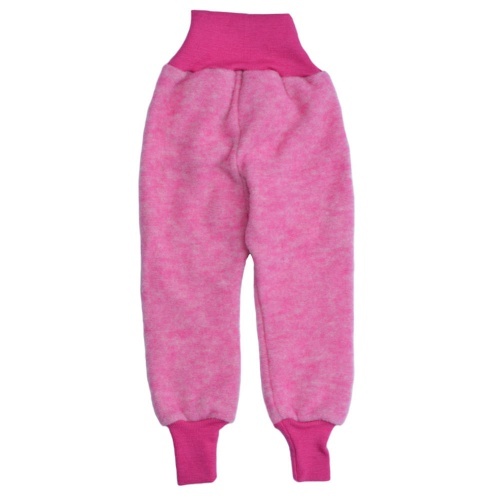 These wool fleece dungarees are soft, warm, cosy, comfortable and very very cute! 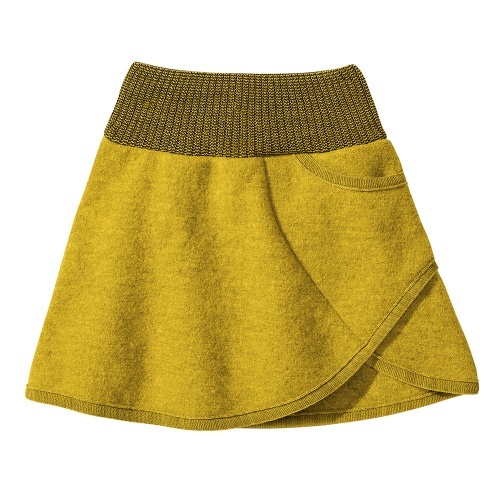 New from Disana's children’s collection, a cute boiled wool skirt. With its clever cut, it doesn’t ride up while playing and running. The high knitted and comfy waistband makes sure that everything stays in place. The knitted waistband is in Disana's two-colour melange look for better matching across the range. A practical and comfortable skirt with two side pockets. The dress is made from a heavy woven organic cotton fabric and comes in a lovely lake blue stripe with a wide but gently elasticated waistband. A beautiful and comfortable sleeveless dress with two large pockets on the sides. 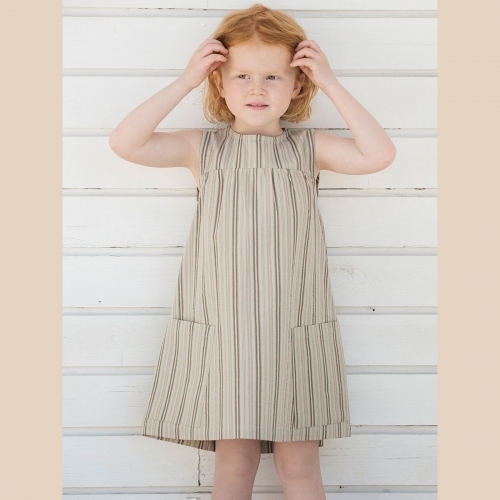 The dress is made from a heavy woven organic cotton fabric and comes in lovely summer stripes and lake blue stripes with nickel free poppers at the back. We love it! A beautiful and light and comfortable short-sleeved gauze dress. The dress is double layered organic cotton fabric and comes a a lovely light herb green and dark siena pink with a two tiered skirt, dropped sleeves & a shell button at the back. We love it! 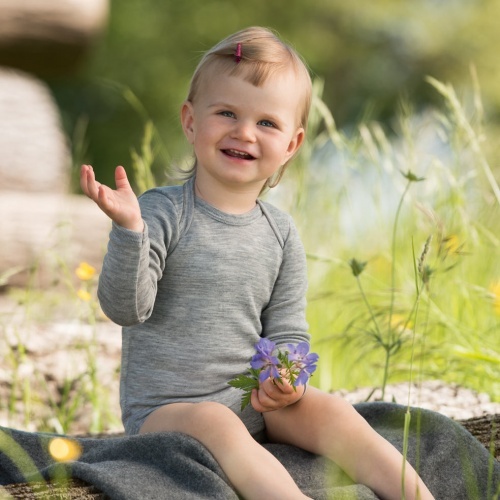 A beautiful raglan sleeve A-line dress in organic cotton brushed flannel with three flower embroidery at the front. With a round neckline, two side pockets & a zip back closure. A beautiful dress to wear at school, at home, at parties and up trees! 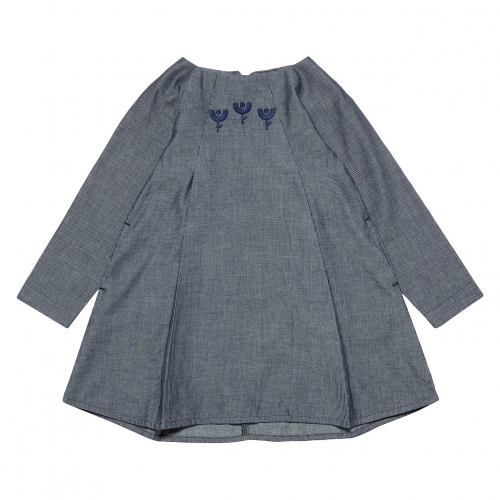 A beautiful raglan sleeve A-line dress in organic cotton chambray with three flower embroidery at the front. With a round neckline, two side pockets & a zip back closure. A beautiful dress to wear at school, at home, at parties and up trees! 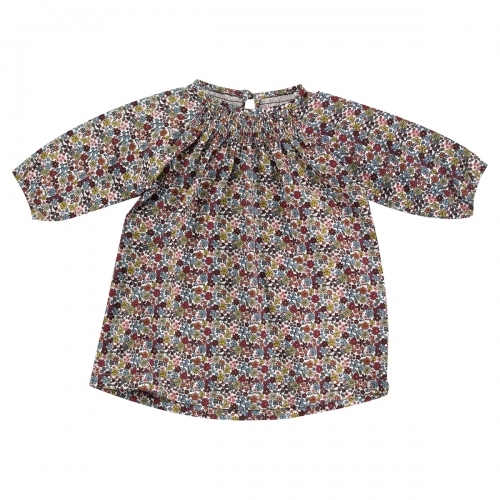 A lovely floral pattern A-line dress in soft organic brushed cotton. A beautiful raglan long sleeved dress, fully lined with organic cotton, nickel free zip at the back and gently elasticated sleeve cuffs ! 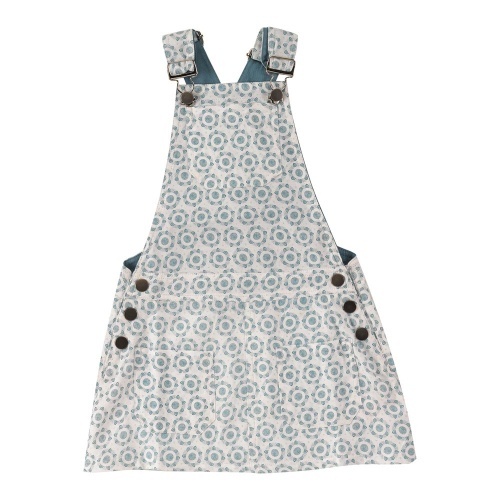 A beautiful simple and practical dungaree skirt in soft organic cotton. A beautiful treat to wear every day. 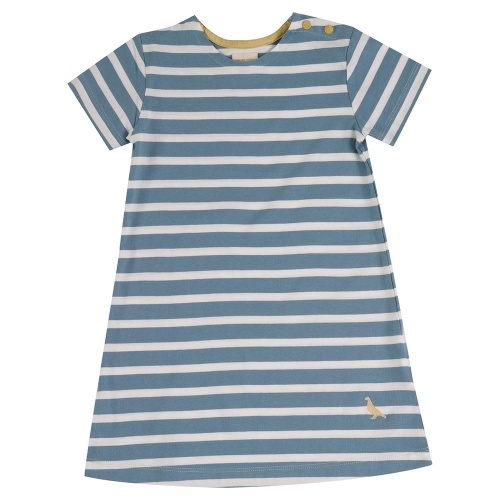 A beautiful short sleeved Breton stripe dress in soft organic cotton. A beautiful treat to wear every day. 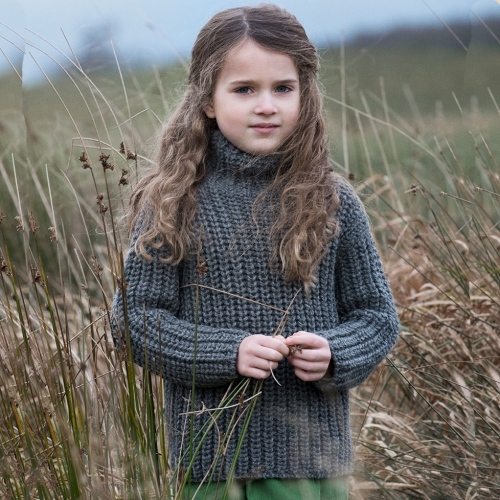 A sweet knitted tunic in Puri's organic cotton and wool blend. 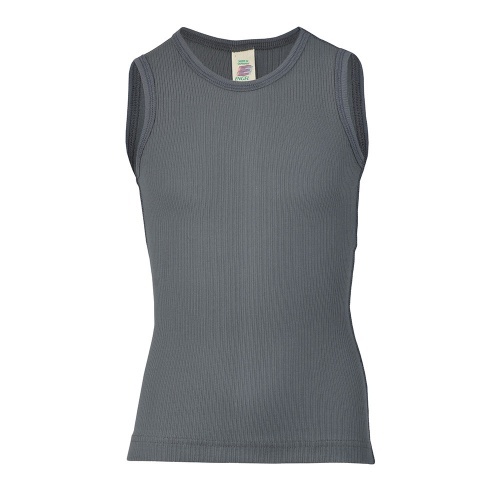 Fastened by two shell buttons at the rear, the upper half in a thicker stretchy ribbed knit provides a nice snug fit. Some additional detailing around the armholes and a contrasting adjustable cord with pompoms woven through the fabric are the perfect finishing details to this adorable tunic. 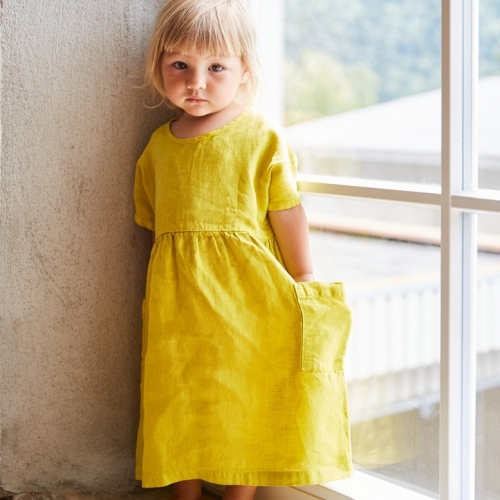 We couldn't help but offer our customers the Matona range, we just love the fabric quality, beautiful designs and feel that Matona truly fulfil our brief of offering sustainable natural healthy fabrics in comfortable and practical designs that can be handed down through your family.. A beautifully simple dress for toddlers and children too. Great for all-seasons, this stripy skirt by Engel has a stretchy waistband which is gentle on tummies. But - more importantly - it is perfect for twirling! 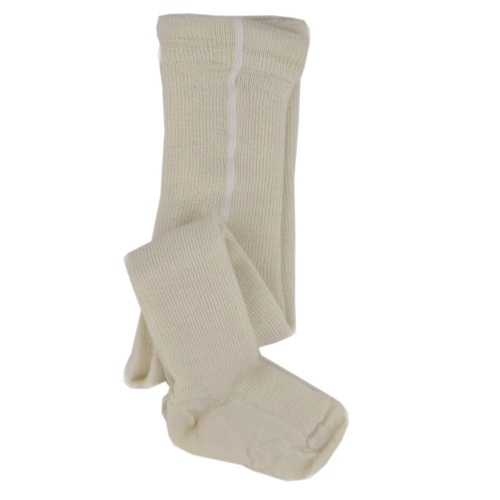 Organic cotton ankle socks for babies and children and adults in a soft, medium-fine knit. Soft ribbing ensure they stay up (they do!) and are comfortable. 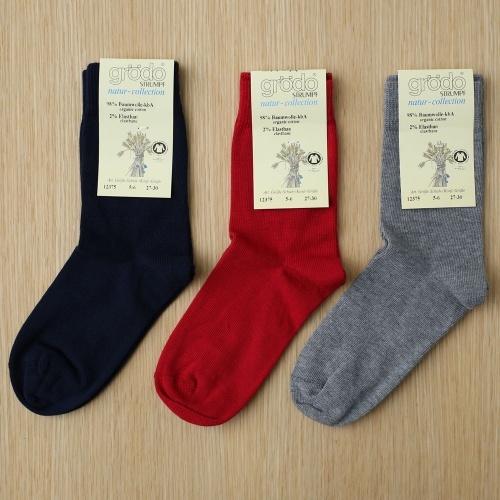 Well-made, great simple socks. 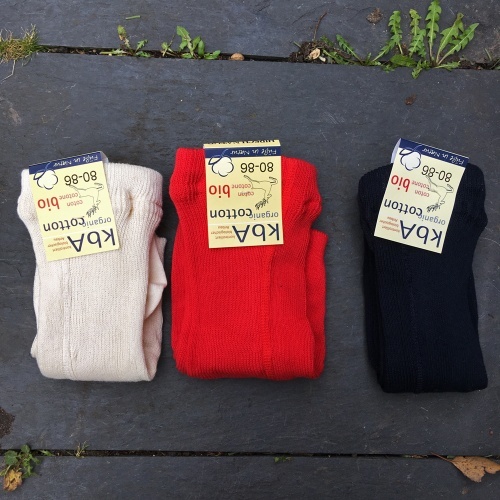 Two pairs of ribbed knee high school socks in soft organic cotton. 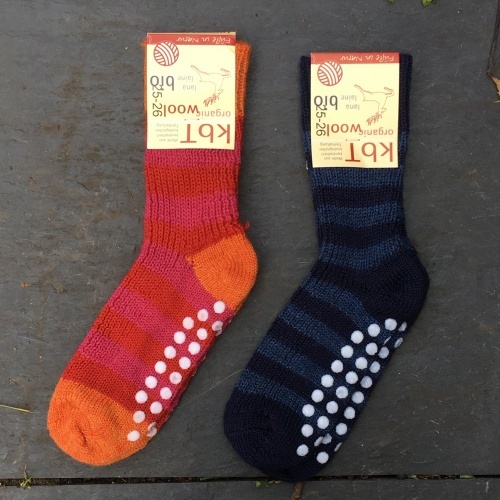 2 pairs of wool-rich socks, with seamless hand-stitched toes for comfort too. 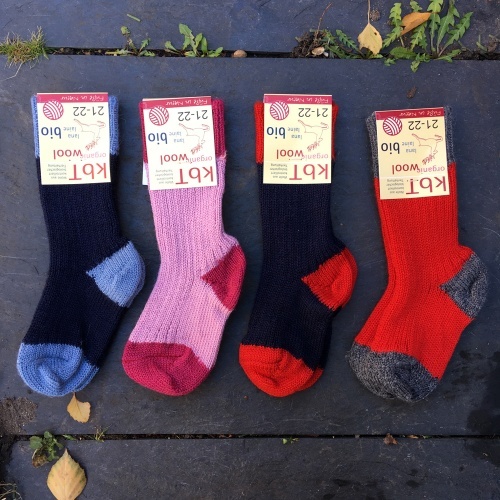 And when we say wool-rich, we mean it - 75% warming, insulating, breathable wool in each sock! 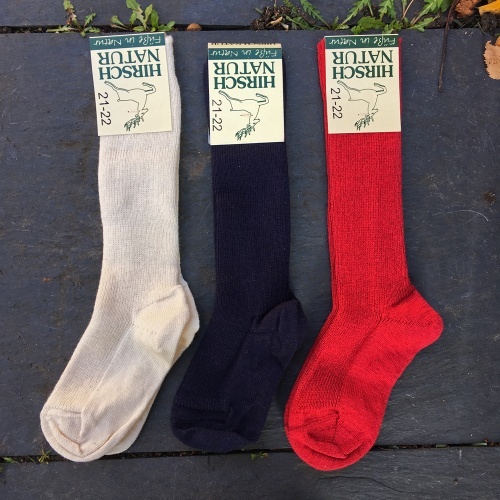 Breathable, comfortable, durable soft knee-high socks in organic natural fibres that nourish the foot, keeping the skin dry and the feet comfortable. 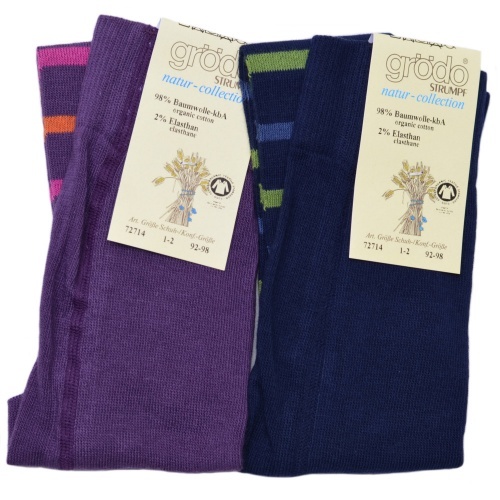 These gorgeous socks will keep feet cosy - from newborn babies to children's sizes. 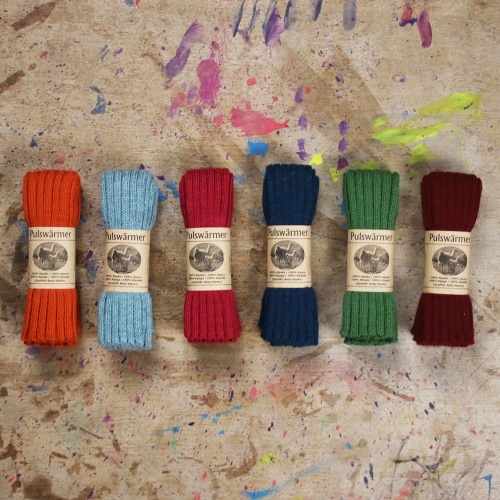 Wool terry is perfect to give your feet warmth and comfort whilst letting them breathe. 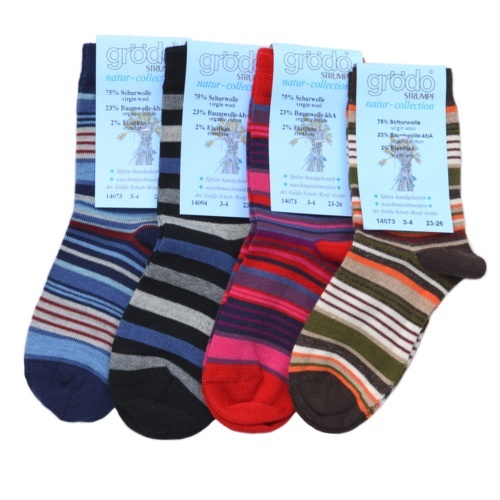 Our best-selling stripy socks are now available in plain colours suitable for school! These comfortable socks have great colour! 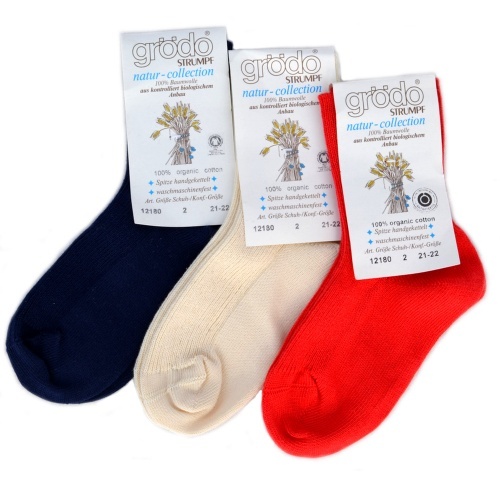 The longer organic cotton fibres keep them soft and comfortable and the small amount of elastane makes the fit perfect. 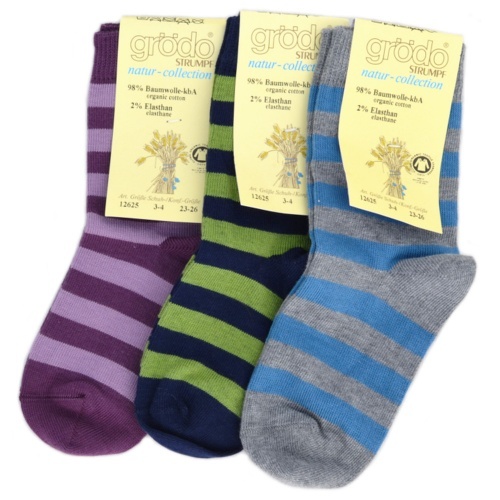 2 pairs of comfortable and practical everyday socks in lovely stripes. 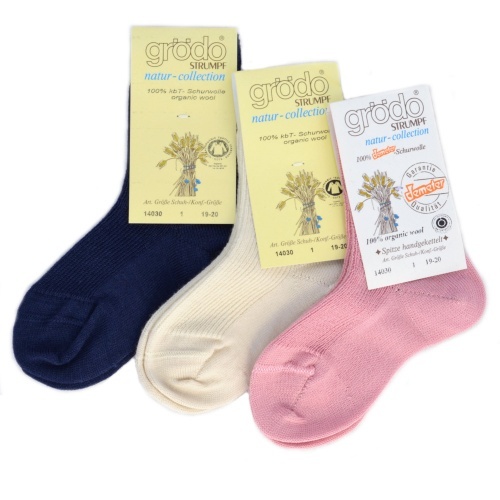 Highest quality organic wool socks for babies, children and adults. 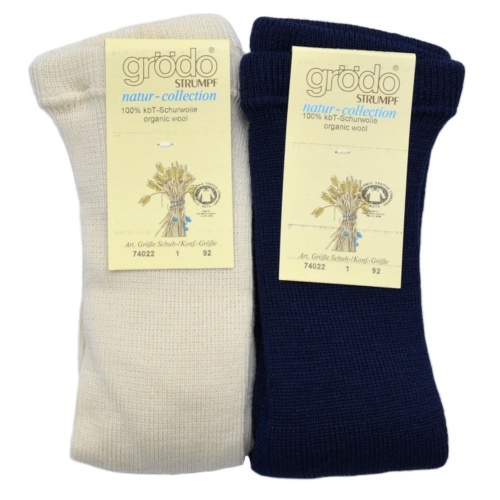 These thicker-knit socks are perfect for boots, and are the softest we have found so ideal for delicate skin. 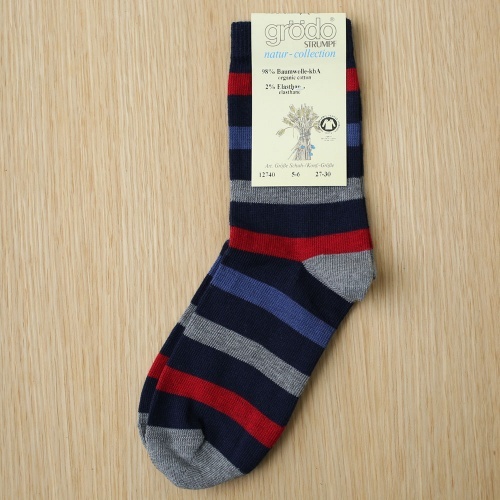 Though they're thick-knit, they are slightly slimmer than our Basic Thick Knit Socks, and are much softer. 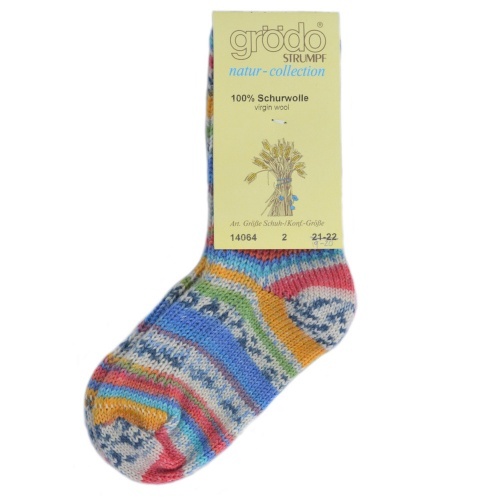 Gorgeous knitted ankle-length socks in soft pure wool. Beautifully finished around the toes and heel. Wear then air. 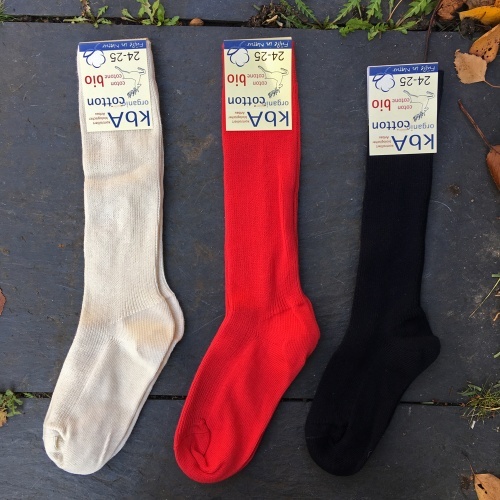 2 pairs of wool socks per pack. 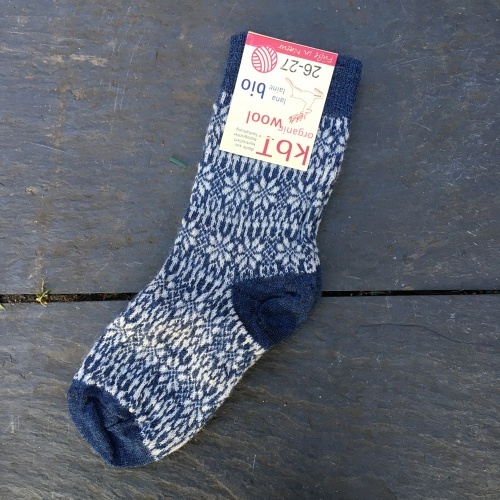 Gorgeous Norwegian fair-isle socks which are fine enough to be worn every day with shoes and thick enough to make wellies cosy. 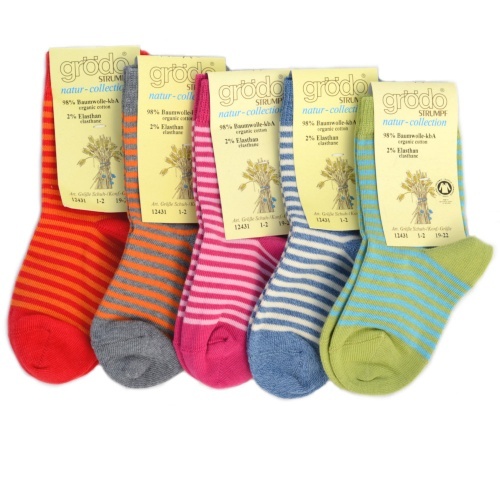 These gorgeous socks will keep feet cosy - from newborn babies to adults with small feet. 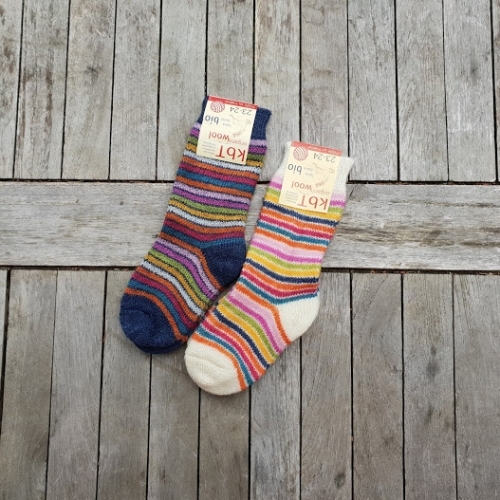 Wool terry is perfect to give your feet warmth and comfort whilst letting them breathe. 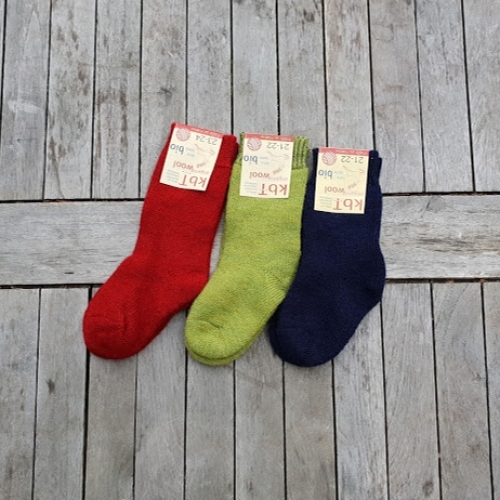 Ooooooh, we so love these gorgeous organic wool socks! 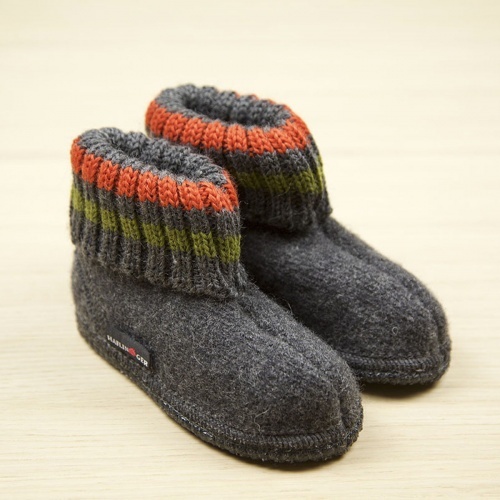 In a hand-knitted style, they'll keep your children's feet healthy and warm. 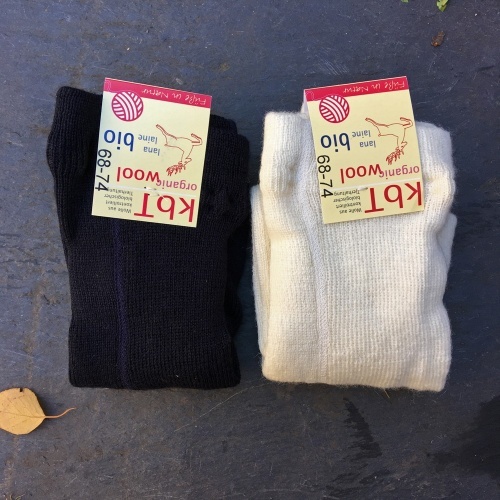 Quite a thick knit for padding around the house and for inside boots, and, with hand-stitched toes, these organic wool socks are seamless inside for optimal comfort. Really lovely and a great gift. 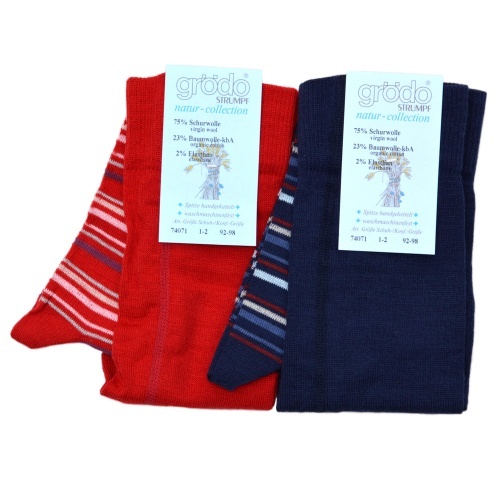 Our best selling non-slip socks are now available in gorgeous stripes! Perfect for wearing around the house or in boots and wellies. 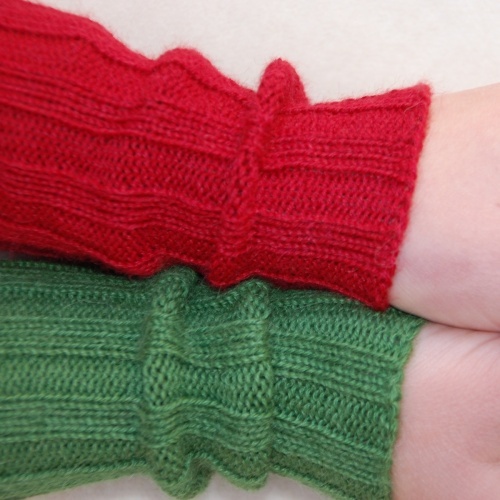 In softest baby Alpaca wool, these children's legwarmers are ribbed for a snug fit and come in heavenly colours and colour is De Colores' speciality. 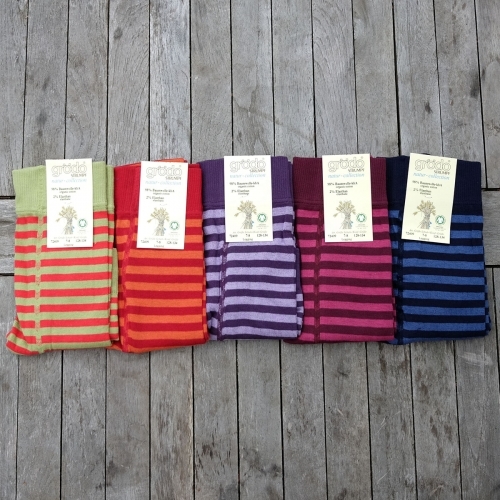 Beautifully stripy tights in natural, organic wool and cotton, with a touch of elastane for comfort. And soft too! Practical and colourful, these everyday tights are a delight. 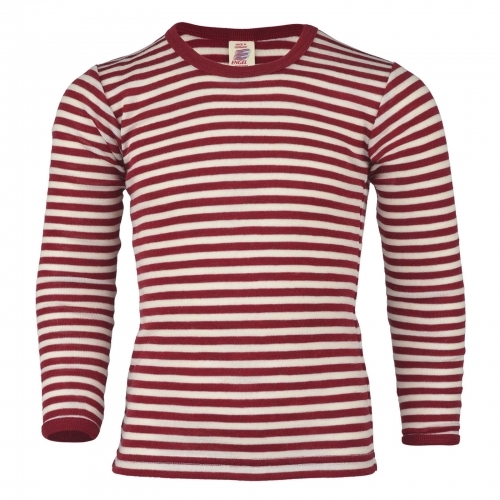 The material is soft to wear and the wide stripes and bright colours make for a popular garment! 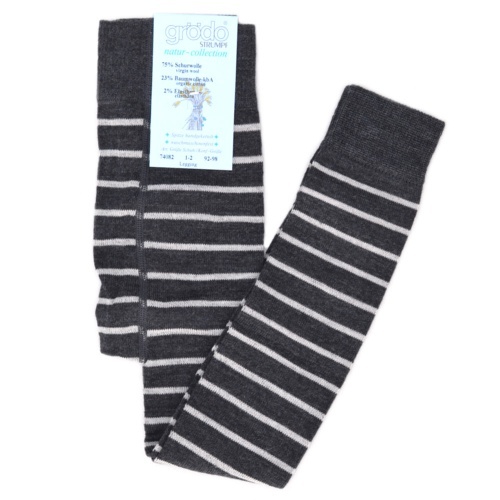 Stripy wool rich tights that your daughter will love to wear. Excellent quality with lots of style! generous waistband and handstitched toes for top to bottom comfort! Exactly what it says - rare, 100% pure organic wool footless tights. Leggings with feet in super-soft 70% Merino wool, 30% organic cotton. Very practical for the sling, pram or for toddling. Stretchy top to keep lower back and tummy warm. 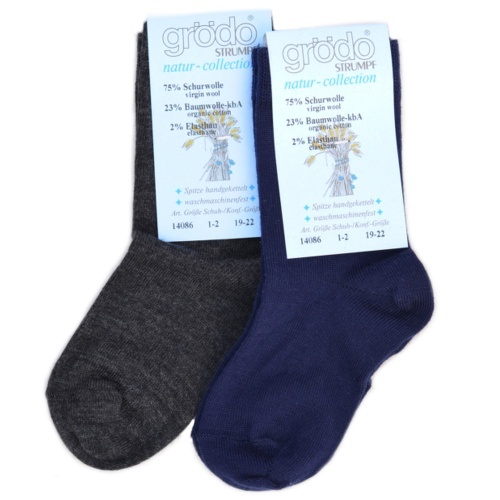 The trouser part is in a medium knit, while the ankle and foot are in a fine knit so that they fit into booties or shoes. These fine-knit soft wool tights will keep your child's legs lovely and warm, and the hand finished seams will keep little toes happy too! 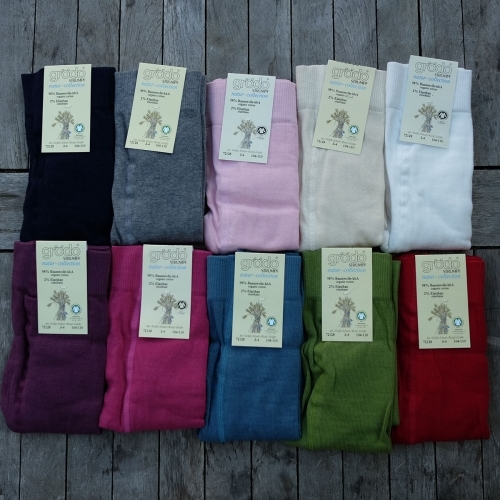 Beautiful finely ribbed tights in 100% soft, breathable organic wool. Well made for toddlers' and children's comfort. 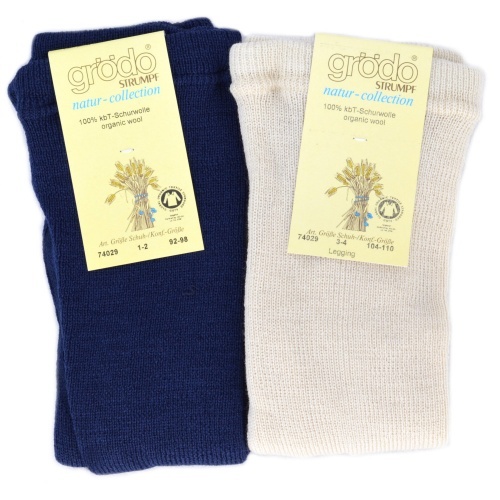 Soft children's tights in 100% organic wool. Practical, breathable, comfortable. Perfect! 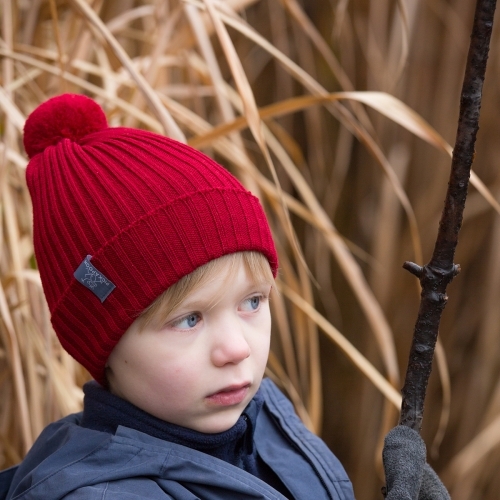 Comfortable, good-looking and breathable, this long beanie hat will delight girls and boys alike across the seasons. 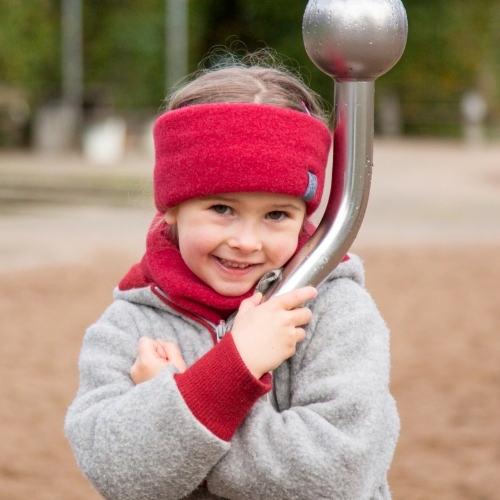 Made from the softest, fleeciest Merino wool, this beautifully headband keeps you or your child's ears cosy and warm while also keeping the skin healthy. soft and breathable and chemical-free! 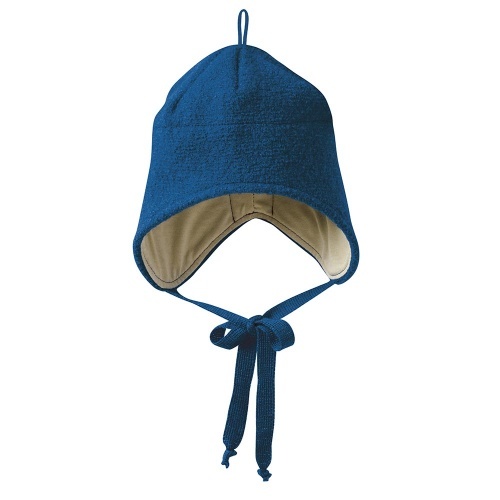 A good quality, stylish and simply adorable winter hat. It fits closely to the head and covers the ears. The outer boiled wool layer is natural and breathable. The organic cotton lining is unbelievably soft! 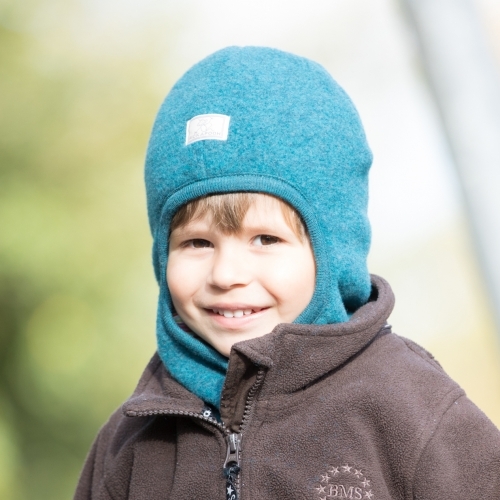 A super soft child's hat made from 100% baby alpaca, ideal for keeping warm this winter. The design provides plenty of room to prevent your head from feeling constricted, while the rib knitted lower edge has enough elasticity to maintain a comfortable fit. 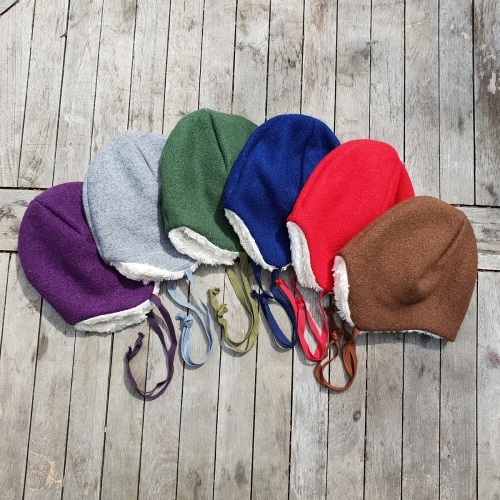 The natural breathability of the alpaca wool will make sure your head is kept warm without feeling excessively stuffy. 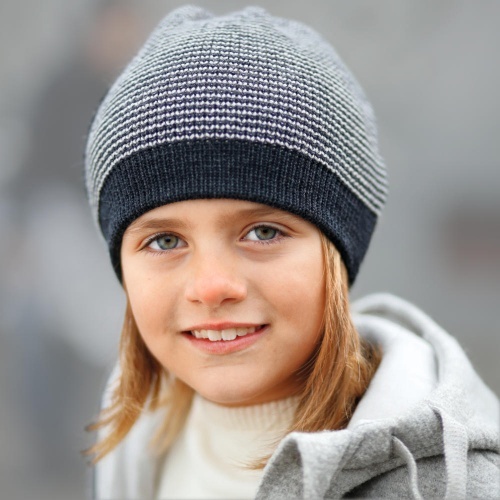 Comfortable, good-looking and breathable, this beanie hat will delight girls and boys alike across the seasons. 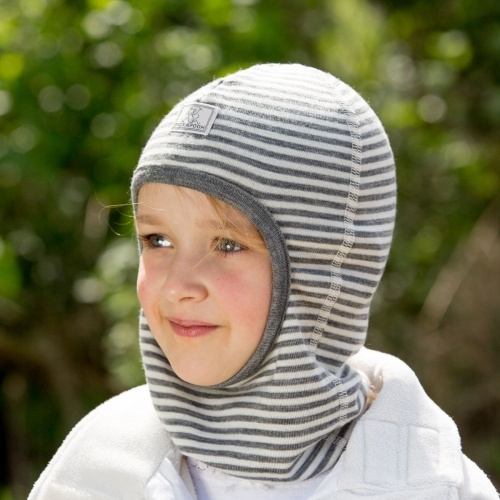 This wool balaclava is extra-special: knitted in 100% organic Merino wool for softness and warmth, it's lined in 100% organic cotton so it's gentle on even the most sensitive skins. long in the neck to keep drafts out! 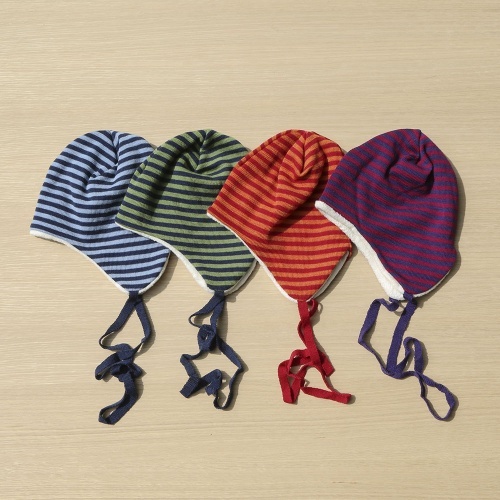 This stripy children's hat is gorgeous-looking, soft inside and practical with its under-arm ties. 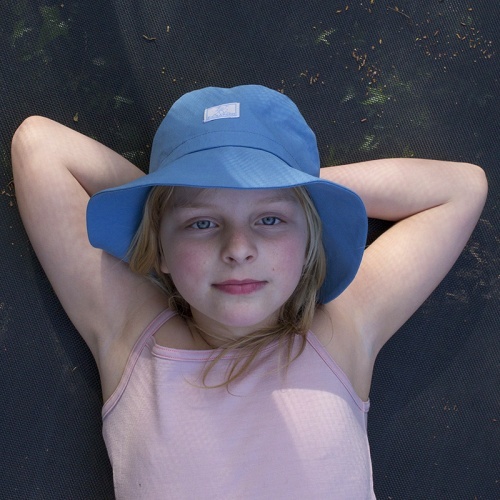 A favourite one for boys and girls, from babies to age 7! 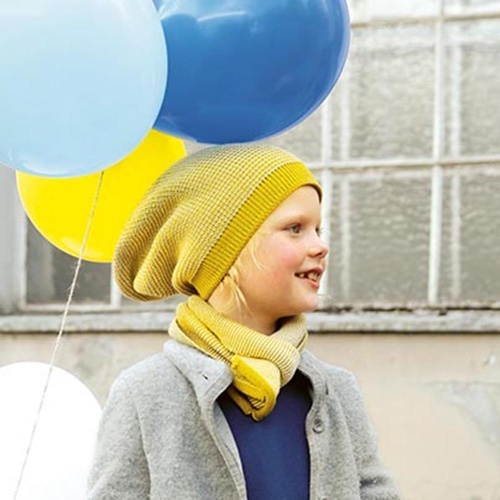 A stretchy pure Merino wool hat to keep your head warm. 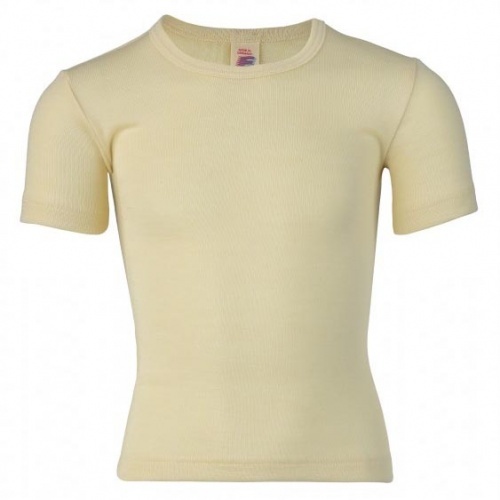 Rib knit for a good fit for all head sizes and the fine Merino wool is soft, warm and breathable. Fitted, soft, healthy and good looking - perfect! 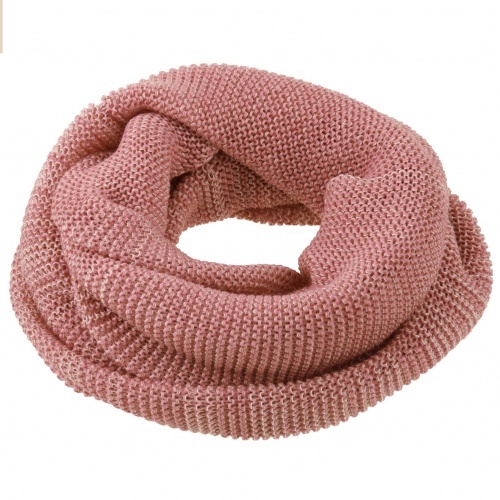 fluffy bobble to make winter fun! 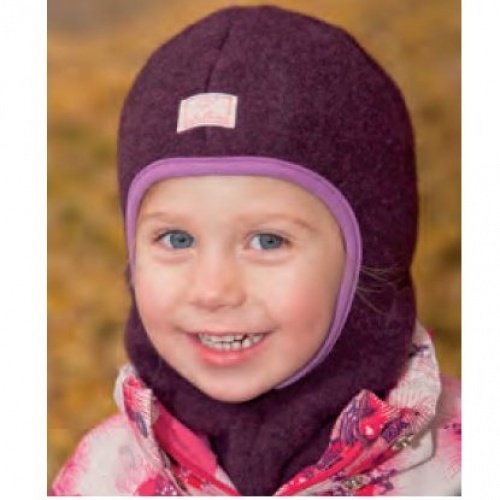 A beautiful, practical, soft and breathable children's balaclava. 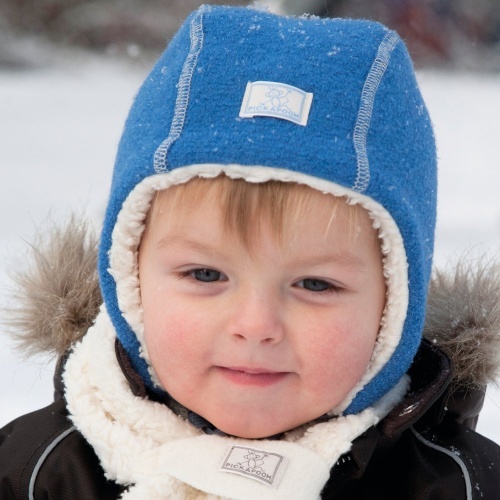 A simply brilliant Winter hat for children. 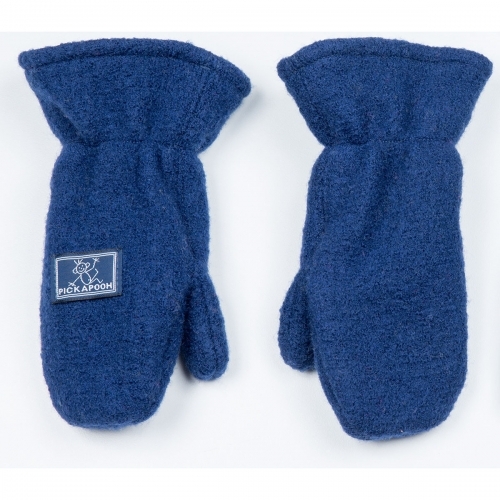 Pickapooh's new and updated version of their bestselling boiled wool mittens, now with elasticated cuffs for easy dressing. 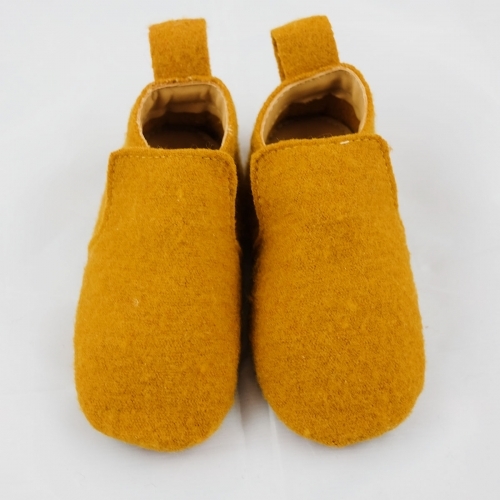 These amazing boiled wool children's slippers by Haflinger are made from natural boiled wool throughout, with a non-slip sole where the wool is infused with natural latex. 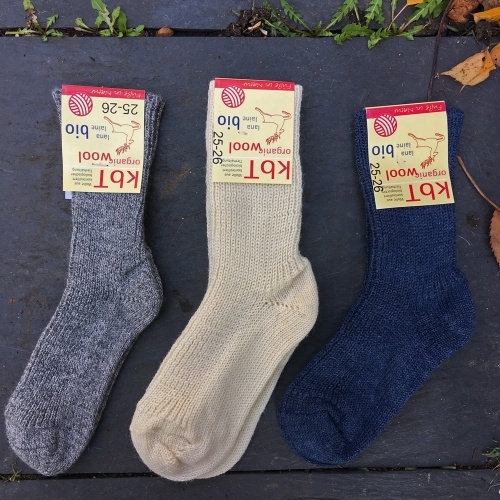 Boiled wool is sturdy yet flexible where necessary, allowing the foot to expand and contract in comfort, and is warm, light and breathable too. 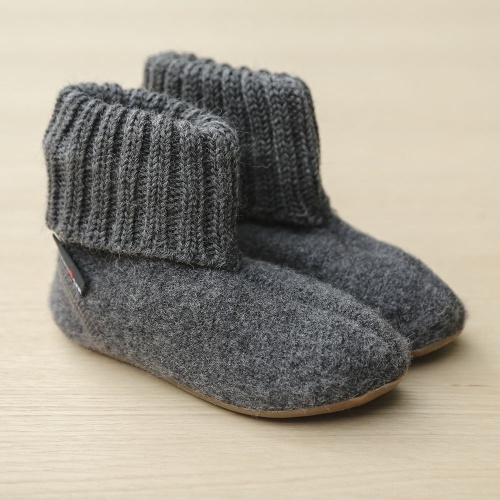 Wool is naturally anti-bacterial, dirt-resistant and breathable, which makes these Haflinger wool slippers the best indoor footwear. Feet stay healthy, warm and comfortable all day long. These first baby shoes are made from all natural materials and will protect your baby's feet whilst keeping them warm and comfortable. 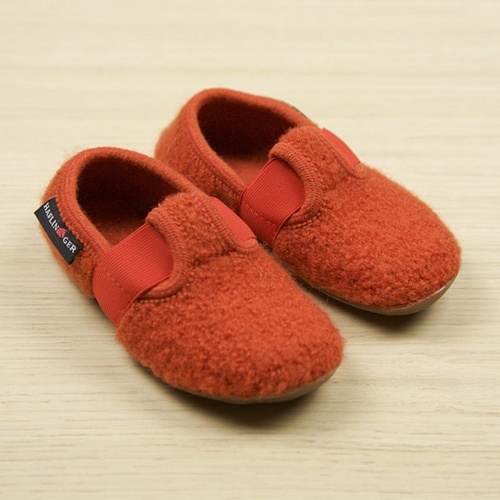 They fit gently and snuggly in the same way as leather baby shoes and have the added benefits of the insulation, breathability, water resistance and softness of boiled wool. 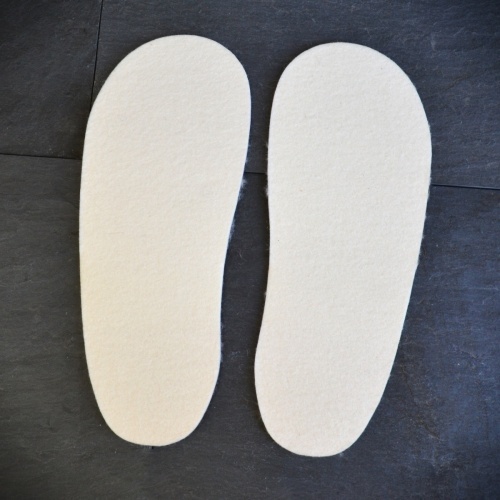 These t-bar slippers are designed to fit comfortably, with an elastic strap across the top of the foot to fit all foot shapes (even high instep) and to flex as the foot bends. 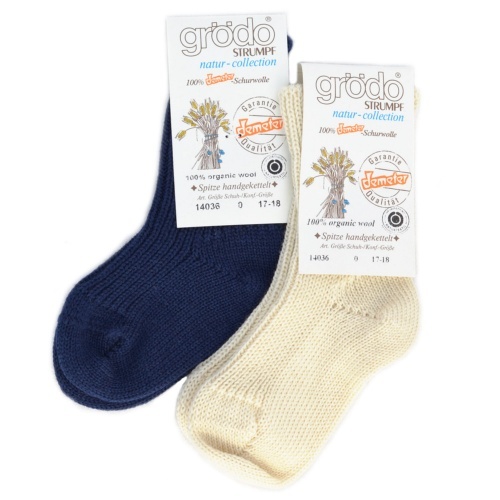 The natural boiled wool is warm and breathable, helping to keep the skin dry and your children's feet at a comfortable temperature. 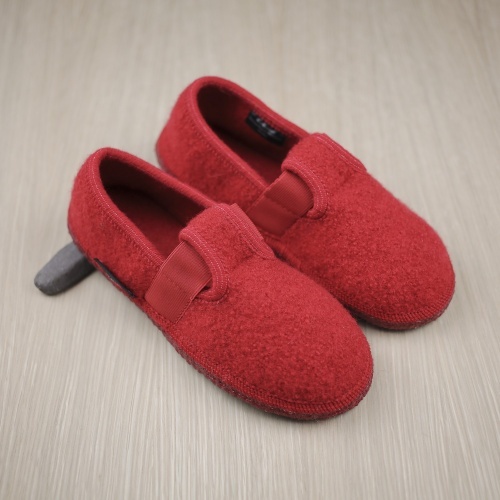 These lovely children's slippers in breathable boiled wool are great because they easily slip on but the elasticated band at the top means they don't easily slip off. 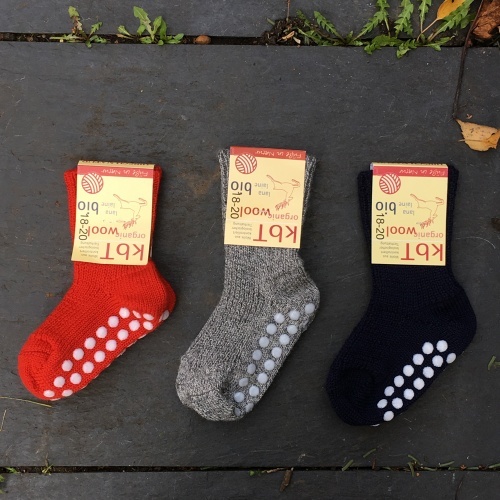 Wool innersoles give a better fit to your shoes through cushioning and supporting the sole of your foot and provide extra warmth too. 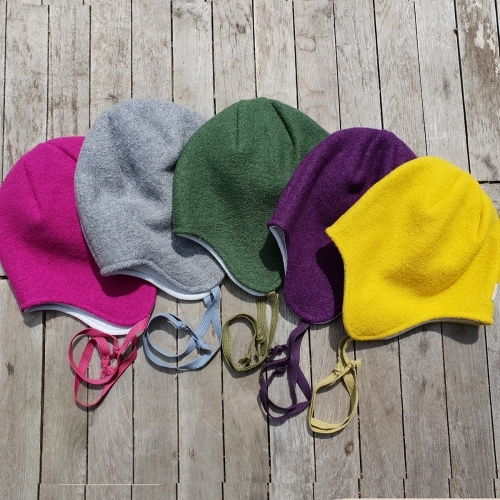 Another benefit is that the pure, felted wool is very breathable and healthy for your skin. 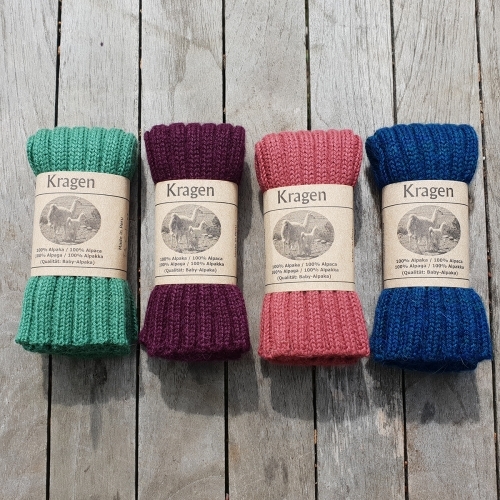 Great for wellies or our beautiful undyed slippers, of course. They're a hidden treat for your feet!